The department of electronics and communication was established in the year 2007.In order to ensure high standards of education for its students, the department has constantly upgraded itself by adding well-equipped and fully furnished laboratories to supplement the theory courses and to provide a conductive work environment for the students. 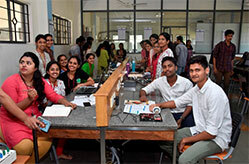 Laboratories like the Analog Electronics, the Microprocessor labs, microcontrollers and HDL Labs have been upgraded with state-of-the-art equipments and many new ones have been added, including VLSI Design, Advanced analog communication engineering, Digital Integrated Circuits, and Digital Signal Processing. Apart from teaching, the faculty members have been vigorously pursuing research and have been regularly participating in various National levels as well as in prestigious conferences to upgrade their knowledge in the specified field. To establish the department as a center of excellence in creating globally competitive, socially responsible engineers to excel in the field of Electronics and Communication by transforming future challenges to sustainable opportunities. • Inculcating a distinctive teaching learning process to provide extensive knowledge of principles to provide solutions to challenges in the relevant domain. • Nurturing the growth of every individual through inventive, dynamic and conducive learning environment using modern education techniques and industry oriented pedagogy. • Imparting leadership qualities with ethical values among students to cater societal and environmental needs. • Establishing hands on experience lab. • Establishing centre of excellence in VLSI and Embedded Systems. • Thirty percent of faculty to complete Ph.D.
• Establishing social innovation research. • Applying the concepts of mathematics, science and engineering for solving problems relevant to environment and society. • Inculcating lifelong learning skills to adapt to dynamic global economics and technological trends. • Inducing ethics, communication skills and leadership qualities with the application of innovative tools and techniques for the betterment of mankind. • Exhibit competency in Embedded system development and VLSI Design. • Capability to comprehend the technological advancement in Signal processing and Telecommunication. Nikhitha C. Deepthi Dayanand Anush Bekal Akshatha D.
Praahas Amin Roopashree Ashwin Kumar Praveen Kumar M.
1. “Reconfigurable Architecture and an Algorithm for Scalable And Efficient Orthogonal Approximation of DCT” IOSR Journal Of VLSI And Signal Processing (IOSR-JVSP), vol. 6, Issue 3, pp. 82-90, June 2016. 2. “Error Correction Technique for Multiple Errors in Parallel FIR Filters” IOSR Journal Of VLSI And Signal Processing (IOSR-JVSP), vol. 6, Issue 3, pp. 100-106, June 2016. 3.“Study on Performance of Vedic Multiplier Based On the Adders”, International Journal for Research in Applied Science & Engineering Technology, vol.4, Issue 5, 2016. 4. "Review on Implementation of ALU using reversible logic gates and Vedic “Mathematics”, International Journal of Engineering Research in Electronics and Communication Engineering,vol.4, 2017. 5.“Implementation of SCN Based Content Addressable Memory” IOSR-Journal of Electronics and Communication Engineering, vol.12,Issue 4, ver.2,August 2017. 6.“Score Level Fusion Based Approach for Water Leak Detection in Infrared Images” International Journal for Research in Applied Science & Engineering Technology (IJRASET), Volume 5, Issue XI, November 2017. 7.“High Speed Arithmetic: Interleaved Modular Multipliers Using Radix 8 Booth Encoder” IOSR Journal of Electronics and Communication Engineering (IOSR-JECE), Volume 13, Issue 4, Ver. I (Jul.-Aug. 2018), PP 31-33. Rao, A. Dwivedi, M. Goswami and B. R. Singh “Effect of Nitrogen Containing Plasma on Interface Properties of Sputtered ZrO2 thin films on Silicon”, Materials Science in Semiconductor Processing (Elsevier Publication), vol. 19, pp.145–149, Mar. 2014. Impact Factor-1.76. Rao, J. Dsa, S. Goyal and B. R. Singh “Radiation Induced Charge Trapping in Sputtered Dielectric Thin Films on Silicon”, IEEE Transactions on Nuclear Science, vol. 61, no. 4, pp.2397-2401, Aug.2014. Impact Factor-1.56. Rao, J. Dsa, S. Goyal and B. R. Singh “Conduction and field induced degradation in thin ZrO2 films sputtered in nitrogen containing plasma on silicon”, J. Mater. Sci: Mater. Electron. (Springer Publication), vol. 25, pp.1583–1588, Mar. 2014. Impact Factor-2.0. Kumar, A. Rao, M. Goswami and B. R. Singh “Electrical characterization of MFeOS gate stacks for ferroelectric FETs”, Materials Science in Semiconductor Processing (Elsevier Publication), vol.16,pp.1603–1607, Dec.2013. Impact Factor-1.76. Verma, A. Rao and B. R. Singh “Electrical characterization of the metal ferroelectric oxide semiconductor and metal ferroelectric nitride semiconductor gate stacks for ferroelectric field effect transistors”, Applied Physics Letters, vol.104, pp.0929071-0929074, Mar. 2014. Impact Factor-3.79. Rao, A. Verma and B. R. Singh “Ionizing Radiation Effects on Electrical and Reliability Characteristics of Sputtered Ta2O5/Si Interface”, Radiation Effects and Defects in Solids (Taylor & Francis Publication), vol.170, no.6,pp.510-518, 2015. On-line Character Recognition for Handwritten Kannada characters using Wavelet features and Neural classifier.In IETE Journal of Research, Vol.46, No.5, pp. 387-392, September-October 2000. Wavelet Features based On-line Recognition of Handwritten Kannada Characters. In Journal of The Visualization Society of Japan, Vol.20, Suppl.No.1, pp. 417-420, 2000. Study, Implementation and Survey of Different VLSI Architectures for Multipliers,in the proceedings of IJCSIET (InternationalJournalofComputerScienceinformationand EngineeringTechnology), Issue2, Volume2, Series-3, August 2012. pp1-5. High Performance FSVQ Image Compression Engine with Multiple Bitrate Control for Advanced Handheld Devices, resubmitted to Journal of Real Time Image Processing, Elsevier. Sensitized Glaucoma Detection by Using a Unique Template Based Correlation Filter and Undecimated Isotropic Wavelet Transform, Journal of Medical and Biological Engineering (JMBE), Springer, Volume37, Number3, 2017. Real Time Transcoding using Fast Requantization Codebook for Vector Quantization", inInternational Journal on Recent Trends in Engineering and Technology, ACEEE, volume6, Digital Object Identifier: 01.IJRTET.06.01.255, pages119-122, November2011. Performance Driven FPGA Design Analysis with ASIC Perspective of Vector Quantization, in the proceedings of International journal Procedia Engineering, Elsevier, ISSN: 1877 -7058, Volume15, pages2819-2823, 2011. Improved Efficiency of Glaucoma Detection by using Wavelet Filters, Prediction and Segmentation Method, International Journal of Electronics, Electrical and Computational System, IJEECS, Academic Science, Volume 3, Issue8, pp.1-13, Oct 2014. Anapproach for detection of Primary Open Angle Glaucoma, International Journal of Advanced Research in Engineering and Technology, IJARET, Volume4, Issue6, pp.185-194, Oct 2013. Towards Extraction of Optic Cup and Disc and Classification of Normal and Glaucomatous Eye Fundus Images, AE International Journal of Science and Technology,AEIJST, Volume2, Issue8, pp.1-12, August2014. Survey of different techniques for Glaucoma Detection and approach for Glaucoma detection using Reconfigurable processor, International Journal of Emerging Technology in Computer Science & Electronics, IJETCSE, Volume14, Issue2, pp.79-83,2015. “Survey on High Speed Low Power Full Adder Circuits” Shrivathsa B, Kiran Kumar.V.G, Nisha. International Journal of Engineering Research & Technology (IJERT), ISSN: 2278-0181 Vol. 7 Issue 07, July-2018. “Implementation of MSEA using 8 bit reversible ALU” International Journal of Engineering Research in Electronics and Communication Engineering (IJERECE) Vol 4, Issue 5, May 2017 PP 79-84. “Design and Implementation of Citrus Classification Architecture on FPGA” IOSR Journal of VLSI and Signal Volume 6, Issue 3, Ver. II, May. -Jun. 2016, PP 18-25. “FPGA Implementation of Lightweight Cryptographic Algorithms-A Survey” International Journal for Research in Applied Science & Engineering Technology (IJRASET) Volume 4 Issue V, May 2016. “An Efficient VLSI Implementation of CDF 5/3 Architecture on FPGA For Image Processing Applications.” IOSR Journal of VLSI and Signal Processing (IOSR-JVSP) Volume 6, Issue 3, Ver. II (May. -Jun. 2016), PP 111-115. “Implementation of Secure and Efficient Arm Based Cryptosystem”, International Journal of Research in Information Technology(IJRIT), Volume 3, Issue 5, May 2015, Pg.210-217. “Design and Implementation of Tiny Encryption Algorithm” International Journal of Research and Applications (IJERA), Volume 5 Issue 6. June 2015 pp -94-97. 2. International Journal of Novel Research in Engineering and Science Paper title A Smart Multipurpose Embedded Can Controller for Spraying Pesticides Quadruped Robot authors Sangamesh .V and Prasanna Kumar.C Certificate of publication ISSN 2394-7349 in 2016. 3.International Journal of Advanced Research in Computer Engineering & Technology (IJARCET) publish paper Blocking USB Drive from Virus Using Filtering Techniques authors Prasanna Kumar. C, Manjunath C R and Ranjith. M Volume 4 Issue 7, ISSN: 2278 – 1323 July 2015. 4. International journal Paper title LOAD FORECASTING FOR ECONOMIC POWER GENERATION AND DISTRIBUTION IN SMART GRID ENVIRONMENT authors Prasanna Kuma. C, Anand B and Manjunath C .R published in COMPUSOFT 2014. 5.International journal Paper title Implementation on FPGA Turbo encoder and decoder authors Manjunath K H, Prasanna Kumar.C and Kiran B, published in IJRCE 2012. 1. A. Bekal et al., "A 6-bit, Reusable Comparator Stage Based Asynchronous Binary-Search SAR ADC Using Smart Switching Network," IET Circuits, Devices and Systems, vol. 12 (1), pp. 124-131, 2018. 2. A. Bekal et al., "Linear relationship ADC with complimentary switch-based bootstrapped sample and hold circuit," International Journal of Electronics, vol. 104(9) pp. 1427-1446, 2017. 3. A. Bekal, S. Tabassum and M. Goswami, "Low Power Design of a 1V 8-bit 125 fJ Asynchronous SAR ADC with Binary Weighted Capacitive DAC," Journal of Circuits, Systems, and Computers, vol. 26(5), pp. 1750077(1-25), 2016. Dsa Joyline, et al. “Design and Fabrication of a Magnetically Actuated Non-Invasive Reusable Drug Delivery Device”, Drug Development and Industrial Pharmacy, Vol. 47, No. 7, pp. 1070-1077, 2018. Dsa Joyline, et al. “Fabrication of Stress and Temperature Measurement Sensors and Possible Integration with Fabricated Biodegradable Drug Delivery Device” International Journal of Electronics and Communications, 2018. 1. Prathiksha Rai, Roopashree, “Secret Visible Mosaic Image- An Efficient Steganography for Convert Communication”, International Journal of Innovative Science & Research Technology, Vol. 3-Issue 5(May 2018), ISSN:2456-2165. 2. Srinidhi, Sharathchandra N R, Roopashree, “Low Latency IFFT Design for OFDM systems”, IOSR Journals, Vol. 13-Issue 3, Ver. 3 (May- June 2018). 3. Sowmya, Roopashree, “Improved Fingerprint Privacy Protection using Combination Method”, International Journal Of Advanced Technology & Innovative Research, ISSN : 2348-2370 (June 2017). 4. Poornima Krishnamoorthy, Roopashree, “Non-Invasive Detection of Coronary Stenosis By Parametric And Harmonic Modeling of Heart Sounds”, Published in IOSR Journal of Electronics and Communication Engineering, Vol. 11, Issue 3, Ver.04 May - June 2016. 5. Ranjini Rao N, Roopashree, “High Frequency Stability 1GHz Temperature Compensated Crystal Oscillator”, Published in IOSR Journal of VLSI & Signal Processing, Vol 6, Issue 3, Ver.02 May –June 2016. 6. 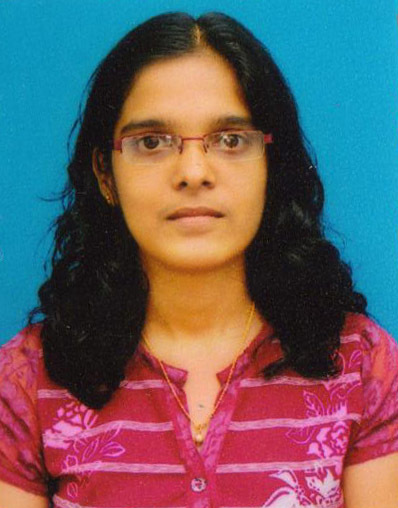 Leema Rachel Mathew, Roopashree, “Optimization and Verification of Bus Interface unit (biu) to increase Performance of the in-house Developed 32-bitRISC processor core”, International Journal of Innovative Research in Technology, Volume 1 Issue 12 May 2015, ISSN : 2349 – 6002. 2. "SAFETY AND DATA ACCUMULATION OF HANGING BRIDGE",Rakesh Kumar 1, Sharathchandra N R2 (June 2016) , IJRIT, ISSN-2001-5569. 3. "ROBOTIC ARM MOVEMENT CONTROL BY GESTURE MADE BY HAND USING SIGNAL PROCESSING",Gowtham1 ,Sharathchandra N R2 (June 2016 ),  IJRIT, ISSN-2001-5569. 1) "Intelligent Energy Saving System for Classroom Based on Pic Microcontroller", International Journal of Innovative Science and Research Technology May – 2018 ,Volume 3, Issue 5, ISSN No:-2456-2165. 2) "Abnormality Detection in Video Stream using Histogram of Optical Flow Orientation SVM Classifier",International Journal of Advanced Technology and Innovative Research (IJATIR),ISSN 2348–2370,Vol.09,Issue.07,June-2017,Pages:1232-1238. 3) "A VHDL Implementation of UART with Error Coding Algorithms",IOSR Journal of Electronics and Communication Engineering (IOSR-JECE), e-ISSN: 2278-2834,p- ISSN: 2278-8735.Volume 12, Issue 4, Ver. I (Jul.-Aug. 2017). 4) "Verification IP of AMBA AXI v1.0 Using UVM",IOSR Journal of VLSI and Signal Processing (IOSR-JVSP) Volume 6, Issue 3, Ver. II (May. -Jun. 2016), PP 54-58 e-ISSN: 2319 – 4200, p-ISSN No. : 2319 – 4197. 5) "Design and Implementation of Uart with Bist for Low Power Dissipation Using Lp-Tpg",IOSR Journal of VLSI and Signal Processing (IOSR-JVSP) Volume 6, Issue 3, Ver. II (May. -Jun. 2016), PP 26-31 e-ISSN: 2319 – 4200, p-ISSN No. : 2319 – 4197.
l Praveen Kumar, “VCO Based Injection Clock Multiplier With A Continuous Frequency Tracking Loop” IOSR Journal of Electronics and Communication Engineering, Volume 13, Issue 4, Ver. I, July –Aug. 2018.
l Praveen Kumar, “Computation of SRT and Cordic Algorithms” IOSR Journal of Electronics and Communication Engineering, Volume 12, Issue 4, Ver. II, July –Aug. 2017.
l Praveen Kumar, “ A Review on Load Positioning Application of Shape Memory Alloy” published in IJERECE Journal, Volume 4, Issue 5, May 2017.
l Praveen Kumar, “Designing a Novel Prototype to Assist and Monitor the Physically Handicapped People Using Intel Atom Processor” in Recent Patents on Computer Science. Vol 8, DOI: 10.2174/2213275908666150804194618. l Praveen Kumar, “VLSI Implementation of High Speed-Low Power-Area Efficient Multiplier Using Modified Vedic Mathematical Techniques” ” in Recent Patents on Computer Science. Vol 8, DOI: 10.2174/2213275908666150220203501. l Praveen Kumar, “Developing the Regressive Test Suite for DS1977 device (iButton)” in the journal of International Journal of Innovative Research in Technology (IJIRT). Volume 1, Issue 12, May 2015, Paper ID: 102296, ISSN: 2349-6002.
l Praveen Kumar, “A comparative study on object detection and tracking in video” in the journal of Engineering Research & Technology (IJERT). Vol 2, issues 12, December 2013, pp 1784-1789. ISSN: 2278-0181.
l Has presented a Technical paper titled “Multiplier and Accumulator Architecture using Carry Save Adder” in International Conference on “Communication, Computation, Management and Nanotechnology” (ICN- 2011) held at REC Bhalki, Karnataka, India. l Has participated in International Conference on “Computing Architecture, Networking & Applications”(ICCANA-11) at NMAM Institute of Technology Nitte, Mangalore. 1. "Canonical Representation in Logspace for Interval Graphs", in International Journal of Trend in Research and Development (IJTRD), ISSN: 2394-9330, vol. 4, issue - 5, September - October 2017. 2. Rahul Shetty, Pavanalaxmi, "Design of Frequency Demodulator Using Goertzel Algorithm", ISSN: 2278 – 909X, International Journal of Advanced Research in Electronics and Communication Engineering (IJARECE), Volume 6, Issue 7, July 2017. 3. Lavita Priya Sanctus, Pavanalaxmi, "Design of Digital Logics for Automatic Temperature Control in Spacecrafts", International Journal of Scientific & Engineering Research, Volume 7, Issue 5, May-2016, ISSN 2229-5518. 4. Kavyashree J, Pavanalaxmi, "BRING YOUR OWN DEVICE (BYOD) DETECTION USING PEREGRINE7 CENTRAL MANAGEMENT SYSTEM", © May 2015, INTERNATIONAL JOURNAL OF INNOVATIVE RESEARCH IN TECHNOLOGY, Volume 1 Issue 12, ISSN: 2349-6002. 5. Pavanalaxmi "DELAY TOLERANT NETWORK FOR MOBILE NETWORKS", International Journal of Advanced Information Science and Technology (IJAIST), ISSN: 2319:2682, Vol.28, No.28, August 2014. Mr. Savidhan Shetty. C. S.
1. "Moving Target Estimation in Non-Homogeneous Clutter for MIMO Radar" in IJERD Volume 3, Issue 9 September 2012. Published a research paper entitled, “Design and Verification of Five Port Router Network”, in IOSR Journal of Electronics and Communication Engineering (IOSR - JECE), Volume 13, Issue 2, Ver. II (Mar-Apr. 2018), PP 89-96. e-ISSN: 2278-2834, p- ISSN: 2278-8735. Published a research paper entitled, “Information Extraction for Graph Data Using Domain Specific Ontology”, in Sahyadri International journal of research (SIJR) Volume3, Issue2, December 2017, ISSN:2456-186X. Published a research paper entitled, “A Survey: Graph Theory in Computer Science and Applications”, in International Journal of Trend in Research and Development, Volume 4(5), ISSN: 2394 - 9333 www.ijtrd.com IJTRD, Sep-Oct 2017. Published a research paper entitled, “A Study and Comparison of Lightweight Cryptographic Algorithm”, in IOSR Journal of Electronics and Communication Engineering (IOSR-JECE), e-ISSN: 2278-2834, p - ISSN: 2278-8735, Volume 12, Issue 4, Ver. II (Jul.-Aug. 2017), PP 20 - 25. Published a research paper entitled, “Implementation of SCN Based Content Addressable Memory”, in IOSR Journal of Electronics and Communication Engineering (IOSR-JECE), e-ISSN: 2278-2834, p - ISSN: 2278-8735, Volume 12, Issue 4, Ver. II (Jul.-Aug. 2017), PP 48 - 52. 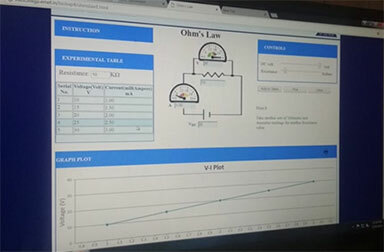 Published a research paper entitled, “Implementation of Sobel Edge Detection using MATLAB-XILINX co-simulation”, in International Journal of Innovative Research in Electrical, Electronics, Instrumentation and Control Engineering, Vol. 5, Issue 7, July 2017 ISSN (Online) 2321 – 2004 ISSN (Print) 2321 – 5526. Published a research paper entitled, “Background Evaluation on 5G and Its Future Technologies”, in International Journal Of Innovative Research In Computer And Communication Engineering (IJIRCCE), Volume 5, Special Issue 4, June 2017. Published a research paper entitled, “Implementation of MSEA using 8 bit reversible ALU”, in International Journal of Engineering Research in Electronics and Communication Engineering (IJERECE) Volume 4, Issue 5, May 2017, ISSN (Online) 2394-6849. Published a research paper entitled, “A VLSI Architecture Of Asynchronous Multiplier”, in International Journal of Engineering, Basic Sciences, Management & Social Studies, Volume 1, Issue 1, May 2017. Published a research paper entitled, “VLSI Implementation of Low Bandwidth ECC Code”, in International Journal of Engineering, Basic Sciences, Management, and Social Studies, Volume 1, Issue 1, May 2017. Published a research paper entitled, "War Field Spy Robot", in Sahyadri International Journal of Research, VOL 4, ISSUE 1, June-2018. · Sri Saikiran1, Gurusiddayya Hiremath2, Praveen Kumar M3 “Multiple Constant Multiplication Architecture Using Graph Based Algorithm” IOSR Journal of VLSI and Signal Processing (IOSR-JVSP) Volume 7, Issue 5, Ver. I (Sep.-Oct. 2017). · Shashi Kumar V, Gurusiddayya Hiremath “Low Power Implementation of RISC-V Processor”, IOSR Journal of VLSI and Signal Processing (IOSR-JVSP) Volume 6, Issue 3, Ver. II (May. -Jun. 2016). · Deepika S S, Ashwin kumar, Gurusiddayya H “A Study on Error Coding Techniques”, International Journal for Research in Applied Science & Engineering Technology (IJRASET), Volume 4 Issue VI, June 2016. · Gurusiddayya Hiremath, Praveen Kumar K and Savidhan Shetty C S, “A Relative study on diverse semiconductor power devices and applications” IC-SMTEE-2016. · Gurusiddayya Hiremath,”Verification of offline signature using Local Binary and directional pattern”, IJISET - International Journal of Innovative Science, Engineering & Technology, Vol. 3 Issue 1, January 2016. Published a research paper entitled "Multiple Constant Multiplication Architecture Using Graph Based Algorithm" in IOSR Journal of VLSI and Signal Processing (IOSR-JVSP) Volume 7, Issue 5, Ver. I (Sep.-Oct. 2017). Published a research paper entitled “Automatic Delivery Bot using RF Communication” in International Journal of Innovative Research in Science, Engineering and Technology (IJIRSET) Volume 6, Issue 8, August 2017. ISSN (Online) 2319-8753, ISSN (Print) 2347-6710. Published a research paper entitled “Railway Track Crack Detection using Image Processing” in International Journal of Innovative Research in Electrical, Electronics, Instrumentation and Control Engineering (IJIREEICE) Volume 5, Issue 6, June 2017. ISSN (Online) 2321-2004, ISSN (Print) 2321-5526. Published a research paper entitled “Comparative Study on Implementation of Digital Arithmetic Circuit” in IJRASET Volume 4 Issue VI, June 2016. ISSN: 2321-9653. Published a research paper entitled “Evolution of Networks” in IJIREEICE, Volume 4, Issue 5, May 2016. ISSN (Online) 2321–2004, ISSN (Print) 2321–5526. 3. Attended "Hands on Training" on various equipments and processes in state of the art clean room facility of CEN from Nov 26th - Dec 5th 2012 at IISc, Bangalore. On-line Character/Script Recognition System for Kannada and other Indian Languages Employing Wavelet Features. Accepted for publication in Proceedings of the Indo-European Conference on Multilingual Technologies(IEMCT)June24-25, 2002, Pune. An On-line Signature Verification System. In Proceedings of NCDAR 2001(National Conference on Document Analysis and Recognition), pp.23-29, July2001, PESCE, Mandya. On-line Character Recognition of Indian Languages.In Proceedings of Pre-Conference Workshop on Document Processing, pp.24-27, July2001, PESCE, Mandya. Online handwritten Hindi character recognition using Artificial neural networks and structural features,1st National Conference on Signal Processing communications and VLSI Design(NCSCV-09) organized by Dept.of E&C Engineering, Annauniversity Coimbatore 8-9 May 2009. 1. Paper title Energizing Smart Grid Using Biogas based Generating Unit author Anand Bharadwaj, Prasanna Kumar.C, Presented at University of Kashmir sponsored by UGC Delhi SEEDS - 2015. 2.Paper title SMART SINGLE TOUCH TICKET GENERATING SYSTEM USING ATM CARD authors Kiran J, Prasanna Kumar.C and Shivam Presented at School of Engineering and Technology, JU Bangalore NESP-2014. 3. Paper title LOAD FORECASTING FOR ECONOMIC POWER GENERATION and DISTRIBUTION IN SMART GRID ENVIRONMENT authors Anand Bharadwaj, Prasanna Kumar.C and Satish kumar presented at RVCE Bangalore, NCTAC -2014. 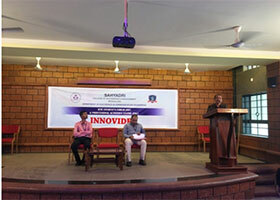 National Conference on Microelectronics organised by International Microelectronics And Packaging Society India Chapter, at Alva’s Institute of Engineering and Technology, Moodbidri on 15th & 16th February 2013. 1. 4th National conference on "Emerging trends in Electronics and Telecommunication NCETEC 2017 held at BGS Institute of Technology , BG Nagara , Mandya and presented a paper entitled " Evolution of 5G and Its future enabling technologies . 2. 2nd National conference on Recent Advances in Engineering and Technology NCRAET 2017 organized by Basavakalyan Engineering college , Basavakalyan Bidar and presented a paper entitled " Background evaluation on 5G and its future technologies. 1. Presented a paper entitled, "A FPGA implementation of SVD processor used in ICA computation for Multi-Channel EEG system", National Conference on "Emerging Trends in Electronics and Communication" (NCETEC-14) conducted on 3rd and 4th april 2014, conducted at BGSIT. Title of the paper "Design and implementation of low power high speed succesive approximation Register ADC"
1. 17th International Workshop on The Physics of Semiconductor Devices, Amity University, Noida, Uttar Pradesh, Dec. 2013. 2. Seventh ISSS International Conference on Smart Materials, Structures and Systems (ISSS – 2014), Indian Institute of Science, Bangalore, Jul. 2014. 3.Participated in “Bangalore INDIA BIO 2016” organized by The Department of Information Technology, Biotechnology and Science & Technology, Government of Karnataka, Vision Group on Biotechnology held at The Lalit Ashok, Bangalore. 4.Presented paper in National Symposium on Nano Science and Technology (NSNST-2016), Indian Institute of Science, Bangalore held on 29th -30th June 2016. 5. Attended two day workshop on “System Design in the Era of Internet of Things by Prof. Joseph Sifakis – Turing Awardee. 6. Attended five days workshop on Analog IC Design organized by M/s Entuple Technologies Pvt.Ltd, Bengaluru. Wavelet Features based On-line Recognition of Handwritten Kannada Characters.In Proceedings of IEEE International Symposium ISPACS-2000(2000 Intelligent Signal Processing and Communication System), Vol.2, pp.605-608, November 2000. On-line Recognition of Handwritten Kannada Characters Employing Wavelet Features.In Proceedings of IEEE International Conference CCSP-2000(Communications,Controls & Signal Processing in the Next Millennium),pp.349-353, July 2000. Writing pad for Indian languages-On-line character recognition system for handwritten characters/script with bilingual facility employing neural classifiers and wavelet features.InProceedings of NCST International Conference: KBCS 2000: Knowledge Based Computer Systems 2000, pp.1-12, December 2000. Online Signature Verification System using Probabilistic Feature Modeling.In Proceedings of IEEE International Symposium: ISSPA 2001(Sixth InternationalS ymposiumon Signal Processing and its Applications 2001),Vol.1, pp.355-358, August2001. Neural based recognition of machine printed Kannada text using wavelets.In Proceedings of IEEE Fourth International Workshop WOSPA 2002(Workshop on Signal Processing and Applications)Dec’2002, Brisbane, Australia. An Efficient Real Time Video Encoding Using DSP Processor”, In Proceedings of the International Conference on Resource Utilisation and Intelligent Systems, KonguEngg. College, Perundurai, Erode, T.N., Jan.4-6, 2006. Online handwritten Hindi character recognition using Artificial neural networks,In the proceedings 3rd international conference on information processing, organized by UVCE, Bangalore, August 7-9 2009. page53-61. An Improved Reusable Component Architecture for K dimensional 4codebook VQEncoder, International Conference on Electronic Design and Signal Processing(ICEDST-09), Manipal, pages 271-274, December 2009. Speed Optimized LUT based K dimensional Reusable VQ Encoder Core,2nd International Conference on Electronic Computer Technology(ICECT2010), ICECT2010, IEEEXplore, Kuala Lumpur, Malaysia, IEEEExplore, Digital Object Identifier:10.1109/ICECTECH.2010.5479963, pages173-178, May2010. Complimentary method of detection of Glaucoma based on ROI Pre-Processing and Vessel segmentation, International Conference on Recent Trends in Communication and Computer Networks-ComNet-2013, ElsevierProc., 2013, pp.245to249. ---Also,this paper has been published as a Book series in Advances in Engineering and Technology series, 2013, Volume7, pp.245to249, published by Institute of Doctors Engineers and Scientists. Glaucoma Detection byUsing Pearson-R Correlation Filter,Proc.,4th IEEE International Conferenceon communication and Signal Processing, Melmaruvathur, Tamilnadu, India., IEEE Xplore, p.1194-1198, April2015. Survey of different techniques for Glaucoma Detection and approach for Glaucoma detection using Reconfigurable processor,International Conference on Emerging Trends in Engineering Sciences(ICETES), Jain Engineering College, Belgaum, Karnataka, April 2015. DWT based Joint Compressive Sensing and Recovery of MECG Signals, International Conference on Wearable Technologies(ICOWT-17), Dayananda Sagar University, School of Engineering, Bengaluru,June 2017. Ø Ø “Lightweight cryptography for wireless sensor network using modified RC4 algorithm” Third International conference on Elctronics,Communication, Computer Technologies and Optimization Techniques (ICEECCOT-2018)” Asmita Poojari,Nagesh H R, Kiran Kumar.V.G and C.Shantharama Rai December 12-15, 2018 in association with IEEE Bangalore section, organized by GSSS Institute of Engineering and Technology for Women, Mysuru. Ø “Implementation of Lightweight Cryptographic Algorithms in FPGA” Second International conference on Circuits, controls and communications” Kiran Kumar.V.G ,C.Shantharama Rai,Asmita Poojari and Nagesh H R, December 15-16, 2017 with Technical co-sponsorship from IEEE Bangalore section, IEEECAS society Bangalore chapter, IEEE CIS society Bangalore chapter, IEEE COMSOC society Bangalore chapter. 1. International Conference on Signal Processing, Communication and Computational Research organized by IFERP Low cost Heart Multiparameter Monitoring and Arrhythmia analysis using MATLAB. Authors Ashwin N Sharavu and Prasanna Kumar. C in the year 2016. 2. ScienceDirect International Conference on Information Security & Privacy Survey over Genetic Algorithm and Application of Wireless Network System. Authors Vinay Kumar S B, Prasanna Kumar.C, Abhinav Mishra, MonicaB V and Bimaendu Shahi in the year 2016. 3. ScienceDirect International Conference on Information Security & Privacy Role of Diameter Based protocol in enhancing of new and Upcoming Technologies Authors Vinay Kumar S B, Prasanna Kumar.C, Abhinav Mishra, MonicaB V and Bimaendu Shahi in the year 2016. 4.IEEE International conference. Paper title SMART WATER METER authors Prasanna Kumar.C Sharath, Sachin jain, Suhash and Vinaykumar S B at REVA University Bangalore in 2014(ICAECC). 5.International conference. Paper title DESIGN AND IMPLEMENTATION LFSR USING CLOCK GATEING TECHNIQUE Authors Manjunath K H, Prasanna Kumar.C and Kiran B. Presented at VIT Vellore 2013. 6. IEEE International conference. Paper title SMART ENERGY METER USING ZIGBEE AND GPRS Author Prasanna Kumar. C, Sandeep Vasista, Tilak and Rimpul at Bombay in 2011(ICCMS). A. Bekal et al., “A Low Power Preamplifier Latch based Comparator Using 180nm CMOS Technology,” IEEE Asia Pacific Conference on Postgraduate Research in Microelectronics and Electronics (PrimeAsia),pp. 208-212, Dec. 2013. A. Bekal et al., “A low power 8-bit Asynchronous SAR ADC design using Charge Scaling DAC,” International Symposium on Electronic System Design(ISED), Dec. 2014. A. Bekal et al., “An Improved Dynamic Latch Based Comparator for 8-bit Asynchronous SAR ADC,” IEEE Computer Society Annual Symposium on VLSI (ISVLSI), Jul. 2015. Dsa Joyline, et al. “Fabrication of Flexible Sensors for Electrodermal Activity Measurement”, in Proc. IEEE 29th International Conference on. Microelectronics (ICM), Lebanon, 2017.
International Conference on Computer Architecture, Networking and Applications organised by NMAM Institute of Technology, Nitte during 7th & 8th January 2011. 1. 14th International conference on Academic Research in Engineering Science and Technology (AREST 2017 ) organized by TEchnical Research Organization India ( TROI ) held at Bangalore and presented a paper entitled  " ICA Algorithm for Image Enhancement and Improvement of Word and Character Recognition in Epigraphs "
1. Nisha, Vishwas K., Suryanarayana K., Rajaneesh Acharya, “Analysis of Multi Coil Induction Heating System for Semiconductor Wafer Processing,” Nitte Conference on Advances in Electrical Engineering, NMAMIT, Nitte on April 11, 2016. 2. Nisha, Vishwas K., Suryanarayana K., Rajaneesh Acharya, “Modeling and Simulation of Multi Coil Induction Heating System for Semiconductor Processing,” IEEE Conference on Recent Trends in Electronics, Information and Communication Technology (RTEICT), 2016. “A Relative study on diverse semiconductor power devices and applications” in the International Conference on Smart Materials and Technologies for Emerging Electronics. IC-SMTEE-2016. Presented the Research paper titled "PERFORMANCE ANALYSIS OF COLOR IMAGE WATERMARKING USING DISCRETE WAVELET TRASFORM" in the International Conference on Innovative Research and Solutions(ICIRS 2015) on April 11,2015 at Bengaluru. The entirety of the short term course was stretched across various phases in 5 days span of time. The first day began with brief introduction of Embedded system design principles and comprehensive discussion on the MSP430 architecture and its trade-offs, after theoretical discussions, practical classes were ascertained with hardware implementation of the concepts learnt using the code- composer studio and Energia IDE platforms. The second day focused on advanced concepts of embedded systems design and implementation of customized code for various sensors and actuators using the MSP430F55 platform. The third day of the workshop was a transition from Embedded systems to the brief introduction of internet of things which required us to understand various industry standard IOT protocols and their theoretical understanding. The fourth day of the workshop revolved around familiarizing with the CC3100 boosterpack hardware and frontend/backend understanding of MQTT and IOT protocols which was followed by practical implementation of all theoretical concepts simultaneously on the hardware. The fifth and the final day of the workshop was completely focused on developing a mini-project “rash driving alert system using CC3100 boosterpack and MSP430” binding all concepts learnt previously to one project, prelude to conclusion the resource personnel0 curated student registrations to Texas instrument’s IICDC, E2E and platform registrations to emphasize the importance of online community. Orientation program for Third Semester students of Electronics & Communication Engineering was organized by the Department of Electronics & Communication. Dr. Ashwath Rao, Head of the Department gave an overview of the department. Dr. Umesh M Bhushi, Director Strategic Planning addressed the gathering. Speaking on the occasion, he conveyed the importance of orientation program and also advised the students that by taking small steps and being focused in life they can reach the goal. A One-Day workshop on Digital Signal Processor TMS320C6748 was conducted for the pre-final year students of Electronics and Communication Department. Mr. Ganesh from Edgate Technologies Pvt. Ltd., Bengaluru was the resource person. He gave a brief note on Analog and Digital signal processing, advantages of digital signal processing over Analog signal processing with emphasis on DSP applications. Various types of Microcontrollers were dealt with in detail during the session. The architecture of TMS320C6748 was thoroughly explained. He also demonstrated the application of Digital signal processing on TMS320C6748 processor. Students had hands-on experience on the processor. Session concluded with discussion on various domains of signal processing and its scope in electronics industries. Mr. Anush Bekal, Associate Professor, Department of Electronics & Communications Engineering has been conferred with the doctorate degree at the 13th convocation held at the prestigious Indian Institute of Information Technology, Allahabad (IIIT-A). The title of his PhD thesis is "Improved Design of Asynchronous ADC with Reduced Comparator Counts" which was carried out under the guidance of Dr. Manish Goswami, Associate Professor & HOD, Department of Electronics & Communication (Microelectronics Division), IIIT-A. This research work was jointly carried out with Prof. Ashok Srivastava, Louisiana State University, USA which has lead to the fabrication of the Integrated Circuit prototype (credits: MOSIS foundry) and has resulted in 6 publications in the standard SCI-journals and IEEE International conferences. Sahyadri College of Engineering & Management, Mangaluru, in association with Visvesvaraya Trade Promotion Centre (VTPC), Department of Industries and Commerce, Government of Karnataka and Karnataka State Council for Science and Technology (KSCST), has organized a day-long workshop on – “Intellectual Property Rights: Significance in Business and Research on 6th October 2019 at Sahyadri Seminar Hall. Inaugural session was started with the prayer by college choir. Dr.Manjappa Sarathi (Director (R&D),SCEM) welcomed the dignitaries and gave the keynotes about the workshop. He shared the benefits of launching intellectual property (IPR) cell in Sahyadri. Shri. Gokuldas Nayak, Joint Director, DIC, Mangaluru was the chief guest of the inaugural ceremony. He urged the importance of patenting in today’s world. He also added that India is the treasure house of knowledge and it is our duty to protect it by IPR. He appreciated Sahyadri for launching an exclusive IPR cell and also for organizing an IPR workshop for the benefits of researchers, faculties and students. Smt. Prabhavathi Rao (Program Coordinator- IP Initiatives, VTPC, Dept. of Industries & Commerce, Government of Karnataka), shared the trends in Intellectual Property Ecosystem and also highlighted the Initiatives from Government of Karnataka, Centre for Export Promotion towards this. The presidentail remarks were given by Dr. Rajesha.S (Dean Academics-SCEM). He gave a overview of patenting process and commercialisation. The workshop was coordinated by Mr. Sharathchandra N R.
Department of Electronics and Communication organized PCB design workshop with the initiation and support from our Principal Dr. Srinivasa Rao Kunte. The objective of the workshop was to help the second year students render better circuit designs for their projects. Mr. Ashwin Kumar, Assistant professor of Electronics and Communication department gave an insight in to PCB Design, giving the students a brief overview on components, Simulators and Fabrication process. The third year students of Electronics and Communication Department were the mentors for the second year students. The workshop included designing PCB using ‘EAGLE’ software followed by preparing the circuit board, printing the circuit layout on the board and etching the unwanted area. Asst. Prof Ashwin Kumar briefed the students about the importance of PCB design. After these session students were divided into 3 batches each handled by students from 5th semester. Designing of circuit UM66 Melody Generated was taught in the morning session of the workshop. Using EAGLE software, the afternoon session included tracing the designed circuit on the copper boards & dissolving these boards in the Ferric Chloride solution to etch the board. The components required for the circuits were placed in their respective places and soldered. At the end of the day students were asked to report with the circuit they had built. •	Two weeks ISTE workshop on “Research Methodology” at JNNCE during 15th to 24th Jan’2013. •	Two weeks ISTE workshop on “Signals & Systems”, conducted by IIT, Kharagpur at JNNCE during 2nd to 12th Jan’2014. •	One Week workshop on “National Board of Accreditation (NBA) and Outcome Based Education(OBE)” organized by JNNCE, Shivamogga held during 23rd Jan’2017 to 27th/31st Jan 2017. •	One Week Faculty Development Programme on “Advanced Microcontroller Programming and IoT” organized by JNNCE, during 12th to 16th June 2017. •	Organized One Week workshop on ‘RecentTrendsinLTE’ organized by VTU and RVCE at RVCE during 29th Jan’17 to 2nd Feb’2018. Workshop on “Engineering Education and Research Seminar” organized by National Instruments at The Gateway Hotel, Mangaluru. 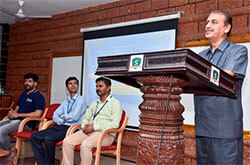 “Advances in Signal Processing and its implementation using VLSI” – AICTE Sponsered FDP – 22nd -24th January 2014 hel;d at P A College of Engineering Mangalore. 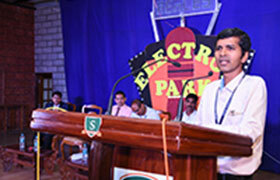 “Embedded Systems Development” – TEQIP II – April 12th and 13th 2013held at NITK Surathkal. · “Training of Evaluators on Outcome based Education and Accreditation” – NBA Nodal Centre, PG Centre VTU regional Office Mysore- 1st to 3rd October 2013. Workshop conducted on "Developing Basic Computer Vision Applications on Raspberry Pi 3" at Springer International Conference on Soft Computing: Theories and Applications (SoCTA 2016), Amity University, Jaipur. 1) INUP Familiarization Workshop on Nano fabrication Technologies in IISc Bangalore,August 2014. 2) INUP Hands-on Training on nano fabrication Technologies in IISc Bangalore May 2015. 1. Participated in TEQIP-III Sponsored 5-days Short Term Training Program on “Optimization Techniques for Signal Processing and Network Communication (OTSPNC-2018)” conducted at NITK Suarthkal, from June 14-18, 2018. 2. Participated in two day workshop on “Machine Learning & its Applications in Engineering & Technology”, organized by MITE Moodabidri, from 6th to 7th April 2018. 3. Participated in three day “Orientation Course in Value Education”, organized by Ramakrishna Institute of Moral and Spiritual Education, from 29th to 31st March 2018. 4. Participated in “System Design in the Era of Internet of Things” by Prof. Joseph Sifakis – Turing Awardee, organized by Sahyadri College of Engineering and Management, from 11th to 12th January 2018. 5. 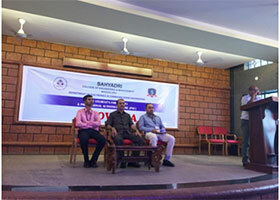 Participated in two days workshop on “Outcome Based Education and Blooms Taxonomy”, organized by Sahyadri College of Engineering and Management held on 12th & 13th July 2013. 6. Participated in “Feel Teacher – Freedom and Punishment” Learning and Development Intervention, organized by Sahyadri College of Engineering and Management, from 16th to 18th July 2015. 9. Participated in Faculty Development Programme on “Virtual Instrumentation Using LabVIEW” conducted by Sahyadri College of Engineering and Management, held on 22nd to 23rd August, 2014. 10. Participated in workshop on “MISSION 10X” organized by Wipro at Sahyadri College of Engineering and Management, from 10th to 12th October 2013. 11. Participated in workshop on “Research Trends in Information Technology (RTinIT)” organized by Dept. 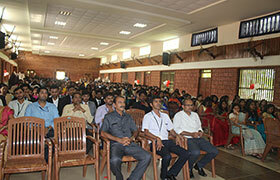 Of Information Technology NITK, Surathkal, on July 11- July 12, 2013. 12. 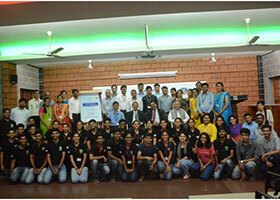 Workshop on “PCB Design & Technologies” organized by click, from 19th & 20th April 2013, at Mangalore. 13. National Workshop on “Getting Started with MATLAB and Simulink”, organized by Dept. Of Mathematics, Manipal Institute of Technology, Manipal during 12-14 July, 2012. 14. Theme Meeting on Medical Instrumentation held on 28th & 29th May 2010, conducted by Father Muller Medical College in association with Board of Research in Nuclear Science, Bhabha Atomic Energy Research Center, Mumbai. 1. FDP ON "VIRTUAL INSTRUMENTATION USING LABVIEW"
2. FDP ON "INTELLECTUAL PROPERTY RIGHTS : SIGNIFICANCE IN BUSINESS AND RESEARCH "IN ASSOCIATION WITH KSCST , GOVT OF KARNATAKA AND VTPC , FOVT OF KARNATAKA. 5. SYSTEM DESIGN IN ERA OF INTERNET OF THINGS BY JOSEPH SIFAKIS , TURING AWARDEE IN COMPUTER SCIENCE. l Attended a STC on “Applied Optimal Control and State Estimation” Organized by Centre for Continuing Education, IISc Bangalore from 2nd to 6th July 2018.
l Attended a STC on “Analog IC Design-Circuit and Design Methodologies” conducted by Entuple technologies Pvt. Ltd Bengaluru at SCEM Mangalore from 5th to 9th Feb, 2018.
l Attended two day’s workshop on “System Design in the Era of IOT” by Prof. Joseph Sifakis-Turing Awardee, from 11th to 12th January 2018 at SCEM Mangaluru. l Attended two day’s workshop on “Outcome Based Education and Bloom’s Taxonomy” organized by SCEM, Mangaluru from 12th to 13th July 2017.
l Attended a two days workshop on “VLSI Design Using Open Source EDA” held on29th to 30th July 2016 at SCEM, Mangaluru. l Attended a workshop on “Nanotechnology and Sensors” Organized by IEEE Bangalore section at IISc Bangalore. 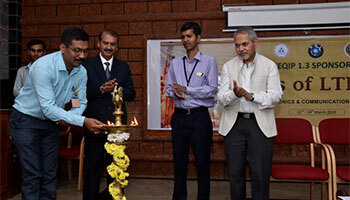 l Attended a AICTE sponsored workshop on “Advances in signal processing and its implementation using VLSI” Organized by P A college of engineering Mangalore. l Attended a workshop on “PLC and SCADA” organized by VTU Regional center Mysore. l Attended a workshop on “Excellent Leadership” organized by SCEM Mangalore at Ocean pearl hotel. l Attended a workshop on “model based development and testing of safety critical control system using Mat lab” Organized by NMAMIT, Nitte in association with MOOG India Technology Center, Bangalore. l Attended a workshop on “Application of lab view” Organized by NMAM Institute of Technology Nitte. 1. TEQIP-III Sponsored 5 Days Short Term Training Program on “Optimization Techniques for Signal Processing and Network Communication (OTSPNC-2018)”, from June 14-18 2018 at Dept. of ECE, NITK, Surathkal. 2. Workshop on “New Model Curriculum for First Year BE/B.Tech-CBCS Detailed Syllabus (2018-2019) as per Outcome Based Education (OBE) formate including Course Outcomes (CO) and Bloom’s Taxonomy” under TEQIP-1.3 held on 19/05/2018 at SCEM, Mangaluru, organized by VTU, Belagavi. 3. 3 day “Orientation Course in Value Education” organized at RIMSE, Mysuru from 2nd to 4th March 2018. 4. 2 day Workshop on “System Design in the Era of Internet of Things” by Prof. Joseph Sifakis – Turing Awardee, Dated: 11th & 12th January 2018, @ Sahyadri Campus, Mangaluru. 5. 2 days workshop titled “Outcome Based Education and Blooms Taxonomy” organised by Sahyadri College of Engineering and Management, Mangalore held on 12th and 13th July 2017. 6. 2 days workshop on “VLSI Design Using Open Source EDA” held on 29 & 30th July 2016, in Sahyadri College of Engineering and Management, Mangalore. 7. 3 days training programme in “Advanced Learning Platform & Solutions” of iWave with iWave Systems Technologies Pvt. Ltd. from 3rd to 5th August 2015. 8. 2 day workshop on”Self Esteem & Work Ethics” by Sahyadri College of Engineering and Management, Mangalore from January 21st to 22nd, 2015. 9. 2 week ISTE National level workshop on “Control Systems” by IITK from December 2nd to 12th 2014. 10. 2 day FDP on”Virtual Instrumentation using Labview” by Sahyadri College of Engineering and Management, Mangalore from August 22nd to 23rd, 2014. 11. 3 day National level workshop on”NS-3 for wired/wireless network” at CSE Department, NITK, Surathkal from July 3rd to 5th, 2014. 12. 1 day FDP on ”Student Enterprise” by Dept. 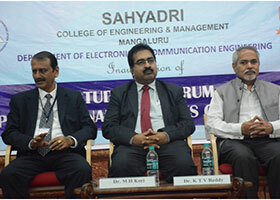 of MBA, Sahyadri College of Engineering and Management, Mangalore on March 21st, 2014. 13. 3 day workshop on”National Entrepreneurship Network” by Wadhwani group from August 31st to September 2nd, 2013. 14. 3 day FDP on”FEEL TEACHER” by CLHRD from July 26 to 29th, 2013. 15. 3 day workshop on”INTEL Atom Kit Processor” by Sahyadri College of Engineering and Management, Mangalore from July 22nd to 24th, 2013. 1. Coordinated a one day workshop on “Intellectual Property Rights” conducted by Dept. of IT-BT, held in Sahyadri Campus, 27/10/2018. Worked as volunteer for Chethan Induction Program organized by Department of IT & BT, Karnataka and Infosys, Mudipu, 25/6/2018. Attended workshop on “System Design in the Era of IoT”, held at Sahyadri College of Engineering and Management, by Prof. Sifakis. Attended FDP on Effective teaching methodology organized by RIMSE, Mysore from 16th to 20th Jan, 2017. Participated in Sahyadri Science Conclave held at Sahyadri College of Engineering and Management, 6th -11th Jan, 2018 and part of discipline committee. Attended FDA organized by NEN from August 31st to September 2nd 2013. Participated in four-day workshop on “Introduction to Therapeutic Counselling for Engineering Teachers” held at NMAMIT, Nitte from 16th to 19th July 2013. 1.3 day workshop on”INTEL Atom Kit Processor” by Sahyadri College of Engineering and Management, Mangalore from July 22nd to 24th, 2013. 2. 2 days workshop on “VLSI Design Using Open Source EDA” held on 29 & 30th July 2016, in Sahyadri College of Engineering and Management, Mangalore. 3. 2 days workshop titled “Outcome Based Education and Blooms Taxonomy” organised by Sahyadri College of Engineering and Management, Mangalore held on 12th and 13th July 2017. 4. Attended two day’s workshop on “System Design in the Era of IOT” by Prof. Joseph Sifakis-Turing Awardee, from 11th to 12th January 2018 at SCEM Mangaluru. 5. Attended three day “Orientation Course in Values Education” organized at Ramakrishna Institute of Moral and Spiritual Education(RIMSE)-Mysuru from 9th to 11th April 2018. 3 day workshop on ” INTEL Atom Kit Processor ” by Sahyadri College of Engineering and Management, Mangalore from July 22nd to 24th, 2013. 3 day FDP on ” FEEL TEACHER ” by CLHRD from July 26 to 29th, 2013. 2 day FDP on ” Virtual Instrumentation using Labview ” by Sahyadri College of Engineering and Management, Mangalore from August 22nd to 23rd, 2014. 2 day workshop on ” Self Esteem & Work Ethics ” by Sahyadri College of Engineering and Management, Mangalore from January 21st to 22nd, 2015. 2 days workshop on “ VLSI Design Using Open Source EDA ” held on 29 & 30th July 2016, in Sahyadri College of Engineering and Management, Mangalore. 2 days workshop titled “ Outcome Based Education and Blooms Taxonomy ” organised by Sahyadri College of Engineering and Management, Mangalore held on 12th and 13th July 2017. Attended two day’s workshop on “ System Design in the Era of IOT ” by Prof. Joseph Sifakis-Turing Awardee, from 11th to 12th January 2018 at SCEM Mangaluru. Attended three day “ Orientation Course in Values Education ” organized at Ramakrishna Institute of Moral and Spiritual Education(RIMSE)-Mysuru from 9th to 11th April 2018. 1. Participated in three days workshop on "Analog and Digital VLSI Design Using Cadence Tools" held on 28th to 30th April 2014 at RIT Hassan. 2. Participated in three days workshop on "CADENCE OrCAD PSPICE/PCB design- The analysis and design of electronic circuits and system " held on 12th to 14th January 2015 at Canara Engineering College, Bantwal. 7. Participated in a two-day workshop on “VLSI Design Using Open Source EDA”, organized by Sahyadri College of Engineering and Management, Mangalore and conducted by M.S. Engineering College, Bangalore on 29th and 30th July 2016. 8. Participated in Road to NBA Accreditation a two-day workshop titled “Outcome Based Education and Blooms Taxonomy” organized by Sahyadri College of Engineering & Management held on 12th and 13th July 2017. 9. Attended three-day “Orientation Course in Values Education” organized at Ramakrishna Institute of Moral and Spiritual Education(RIMSE)-Mysuru from 9th to 11th April 2018. 10. Attended five days short-term course on ANALOG IC Design – Circuit and Layout Design Methodologies conducted by Entuple Technologies Pvt. Ltd at Sahyadri College of Engineering & Management, Mangaluru from 5th -9th February 2018. 11. Attended two days workshop on “System Design in the Era of Internet of Things” by Prof. Joseph Sifakis – Turing Awardee organized by Sahyadri College of Engineering & Management held on 11th & 12th January 2018. 12. 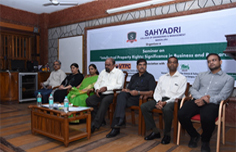 Participated in a one-day seminar on "Intellectual Property Rights: Significance in Business and Research" at Sahyadri College of Engineering and Management, Mangaluru on 6th October 2018. · Successfully completing 8 week NPTEL Online Certification course on "Intruduction to Machine Learning"
· Attended one day seminar on “Intellectual Property Rights: Significance in Business and Research” at Sahyadri College of Engineering and Management, Mangalore on October 2018. · Participated Five days “Sahyadri Conclave – 2018” at Sahyadri College of Engineering and Management, Mangalore on January 2018. · Attended two day workshop on ”System Design in the Era of Internet of Things” at Sahyadri College of Engineering and Management, Mangalore on January 2018. · Attended one day workshop titled “UAVs for Agriculture” at Indian Institute of Science, Bengaluru. · Attended two days “Road to NBA accreditation a workshop on outcome based education and blooms taxonomy” at Sahyadri College of Engineering and Management, Mangalore on July 2017. · Attended one day symposium for college faculty ”PRAJNA 2015” held at Ramakrishna Math, Mangalore on September 2015. · Attended four days’ workshop on “Introduction to Therapeutic Counselling for Engineering Teachers” at NMAMIT, Nitte on July 2015. · Attended two days lecturer series/workshop on” VLSI and Embedded system “ March 2014 at UVCE, Bangalore. · Attended workshop on” Treads and opportunities in the Engineering Sector “on May 2012 at Mauritius. · Attended workshop on “Start your business in ICT sector “on March 2012 at Mauritius. 1. Attended three days “Orientation Course in Values Education” organized at Ramakrishna Institute of Moral and Spiritual Education(RIMSE)-Mysuru from 2nd to 4th March 2018. 2. Attended five days short term course on ANALOG IC Design – Circuit and Layout Design Methodologies conducted by Entuple Technologies Pvt. Ltd at Sahyadri College of Engineering & Management, Mangaluru from 5th -9th February, 2018. 3. Attended two days workshop on “System Design in the Era of Internet of Things” by Prof. Joseph Sifakis – Turing Awardee organized by Sahyadri College of Engineering & Management held on 11th & 12th January, 2018. 4. Participated in Sahyadri Conclave – 2018 held at Sahyadri Campus, Mangaluru, and Dated 6 – 10 January, 2018. 5. Participated in Road to NBA Accreditation a two day workshop titled “Outcome Based Education and Blooms Taxonomy” organized by Sahyadri College of Engineering & Management held on 12th and 13th July 2017. 6. Attended 5 days Hands on Workshop on ‘Do-Engineering-Labview’ conducted by VI Solutions at SCEM from 13th to 17th February 2017. 7. 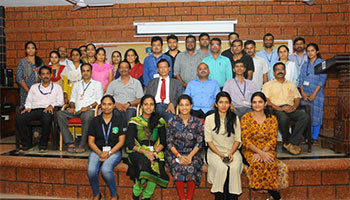 Participated in workshop "FEEL Teacher - Communication" Learning and Development Intervention, organised by Sahyadri College of Engineering and Management, Mangaluru and conducted by CLHRD, Mangaluru, from 13 to 15 July 2015. 8. Attended a Workshop/Training Programme in "Advanced Learning Platforms & Solutions" of iWave for a period of 3 days with iWave Systems Technologies Pvt. Ltd. from 3rd Aug 2015 to 5th Aug 2015. 9. Participated in Seminar on “Intellectual Property Rights: Significance in Business and Research” at Sahyadri College of Engineering and Management, Mangaluru on Saturday, 6th October 2018. Seminar on "Intellectual Property Rights:Significance in Bussiness and Research" at SCEM, mangaluru. Participated on"New Model Curriculum for first year BE/B.Tech CBCS Detailed syllabus as per OBE and blooms taxonomy. Attended workshop on "System Design in the era of internet of things" by Prof.Joseph Sifakis. Participated in two days Advanced FDP on 'Teaching Learning Process' conducted by Sahyadri College of Engineering and Management. Completed 12 weeks NPTEL course on 'Digital Image Processing' Organised by IIT Kharaghpur and secured Elite certificate. 4.Participated in the one week Workshop on NBA/NAAC ACCREDITATION PROCESS FOR TECHNICAL INSTITUTIONS under share and mentor Institutions (Margadarshana)Scheme Sponsored by AICTE from 10th to 14th December 2018,at MSRIT,Bangalore. VGST grant received under the CISEE scheme for project titled " Underground water detection, replenishment and mapping using arial infra- red application to enhance the drinking water resources. “JNANA Sangama” – A Technical National Level Paper Presentation – 25th March 2014 held at VCET Puttur . 1. Applied for Samsung Design Contest 2014 SMART POWDER SPREYER FOR SILK WORMS 2014. 2.Texas Instruments Analog project competition 2013 MICRO GENERATION AND WIRELESS POWER TRANSMISSION-SUVAAYU. 3.Two of my project got selected for JED-I (at IISC Bangalore) competition 2012. 4.Two of my projects got selected for JED-I Competition at IISC Bangalore on in 2011. CADENCE DESIGN CONTEST 2016: Runner-up Project, for the paper titled “VLSI Implementation of High Speed Digital Integrated Circuit for Multiplication Using Modified Vedic Mathematical Techniques” in the Undergraduate category. 1. Has guided more than 8 SPSS projects and 9 SIP projects. 2. Has guided 4 M.Tech projects. 1. A FPGA Implementation of SVD Processor Used in ICA Computation for Multi-Channel EEG System. 2. Area and Power-efficient VLSI Architecture of Asynchronous Multiplier for Filter Design. 3. Analysis of 4-bit Carry Select/Skip Adder. 4. Digital EMG Bio-Feedback Device for Muscle Strength Improvement. On 7 September 2018, a colourful and memorable AENCES branch inauguration was organized by Electronics and Communication Department. The theme for inauguration was "Electrum Park" and the decorations were a clear reflection of it. The grand celebrations commenced by the arrival of the chief guests Dr. Roshan Shetty, Consultant Surgical Gastroenterologist, presided by Dr. R. Srinivasa Rao Kunte, Principal and Dr. Rajesha S, Academic Dean and Dr. Ashwath Rao HOD, Dept. of ECE. There was a colourful welcome followed by a unique LDR sensor based automated lighting of the lamp which caught special attention of the Chief Guest as he appreciated the way technology was used to bring newness to a classical tradition. Use of technology in the fields of medical science helping doctor to take corrective diagnoses steps. He guided with his inspirational words and inspired to do better with a formal vote of thanks the event concluded. 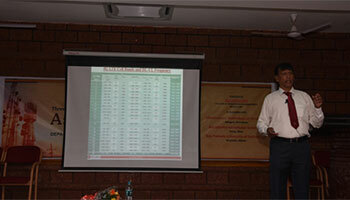 A talk on "National Board of Accreditation (NBA)" was given by Mr. Praveen Konda, Asst. Professor, who explained the process of accreditation and the changes we need to bring up in order to grow better as an institute. It was a truly mesmerizing event as the students presented various programmes like singing, dancing, skits, mono act shows, classical and modern combination of several foot tapping numbers. Everyone sat glued to the show. A farewell programme was organized for the final year outgoing Electronics and Communication Engineering students by AEncES on the 25th of May, 2018. The programme was presided by our principal Dr. Srinivasa Rao Kunte . A video of various activities organized and participated under AEnCES was played before the gathering. The formal programme began with the invocation followed by welcoming the gathering. Students and faculty members of the dept shared their experience during their formation period at the college , the lecturers gave away their feedback and well wishes to the batch of outgoing students (2014-2018) . The Chief Guest, Dr. Srinivasa Rao Kunte , gave away the presidential address and advised No matter wherever life takes , you should always be grateful to your parents , elders and teachers who have nurtured and groomed you. Mr. Gurusiddayya, Co-ordinator of AEnCES , proposed the vote of thanks. 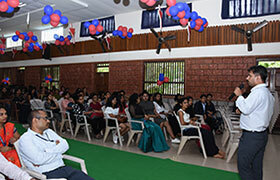 The formal program was followed by the informal function that included various games and activities for both out going students and lecturers. Dr. Ashwath Rao, HoD of Electronics and Communication Engineering told the students to remember where you come from but do not forget their alma mater. ‘Workshop on Self defense for women' was organized by the Department of Electronics and communication engineering and AEnCES students association on the occasion of International Women's day on March 8th, 2018. 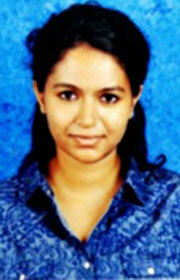 Ms. Sameeksha Shetty, student of ECE second year was the resource person of the day. Students from ECE department Ms. Sushma Shetty represented VTU national cross country twice and Ms. Ankitha NSS Best Volunteer Award were introduced, and appreciated during the occasion also asked to address the gathering. HOD dept. of ECE addressed the women, lady faculties. The session began with a couple of warm up exercises. Miss Sameeksha then introduced the techniques for self defense. The students paired with each other and practiced the same with great enthusiasm. The techniques included few punching movements etc. Department of Electronics and Communication Engineering organized one day event on “Introduction to Electronics Engineering” at Navodaya High School, Bettampady, Puttur. Department of ECE conducted one day event on “Introduction to Electronics Engineering” to the students of Navodaya high school to create awareness on engineering. During the event various sessions were conducted like basics of electronic circuits, circuit debugging and hands on experiment. Students were divided into various groups and were assigned with two mentors each. 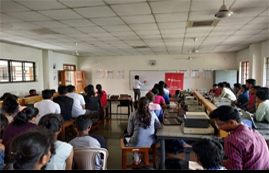 The students were briefed about RLC circuits and semiconductor devices followed by quiz and various experiments conducted on semiconductor devices. The students were also guided about various scholarship schemes like NMMS, NTSE etc. Mr. Ravishankar alumni of Navodaya School, currently studying in final year ECE at Sahyadri placed in Infosys along with students from third semester and faculty members were part of the daylong event. Navodaya High School management and staff appreciated the initiative from Department of ECE, Sahyadri College of Engineering and Management towards helping rural students in motivating them to understand fundamentals of electronics engineering. Further they were also very curious to visit the college and connect with the college. Students from Department of Electronics and Communication Engineering (ECE), won consolation prizefor the project papers titled “SMART DISEASE DETECTION USING RETINAL IMAGE PROCESSING” and “DETECTION OF ACUTE LYMPHOBLASTIC LEUKEMIA USING IMAGE PROCESSING” under the guidance of Mr. PrasannaKumar Associate Professor and Mrs. Roopashree Assistant Professor, Dept. of ECE respectively.Jnana Sangama-2018, a National Level Student Conference held at Vivekananda college of engineering and technology, Puttur. Mr. Ajay K S, Mr. Deekshith N Moily and Ms. Kavya, Ms. Krithi B Shetty are the winners. Total of 26 colleges participated in this event including Sahyadri, Canara and SMVIT and various other colleges from all over Karnataka. 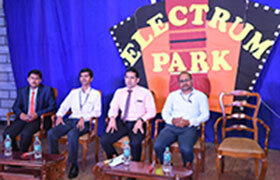 AE nCES, Association of Electronics and Communication Engineering Students for the academic year 2014-15, was inaugurated by the chief guest Dr. Jose Alex Mathew, HoD, Department of Electronics and Communication Engineering, PA College of Engineering, Mangalore . 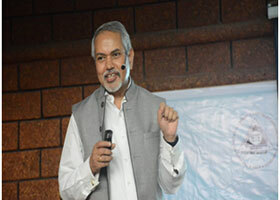 The chief guest addressed the gathering breifly during the formal function and later delivered a lecture on “Digital Image Processing in Medical Field”. Dr. Antony A. J., Vice principal, delivered the presidential address. Prof. M. N. Nayak, Administrator also addressed the gathering. Prof. Manoj Kumar, AEnCES Patron and HoD of department of Electronics and Communication Engineering enlightened the students with his enthusiastic talk. 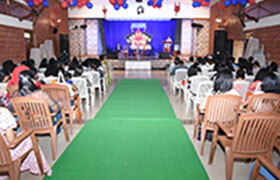 AEnCES, conducts a `Traditional Day’ in the Campus to display Indian culture. Students came attired in ethnic wear. 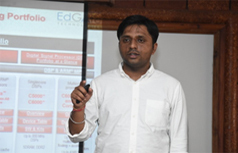 On the occasion, a technical talk was delivered by Dr. Ramesh Kini M., Associate Professor, Department of Electronics & Communication Engineering, NITK, Surathkal, on "FPGA Architecture and its Design." He spoke on the architecture and design of Spartan 3E. Students showcased their talents through technical and cultural events. AEnCES, organised a three-day workshop on Circuit Simulation and PCB Design using OrCAD. FTD Automation Pvt. 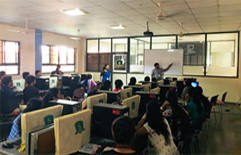 Ltd., with its headquarters in Bangalore, conducted the workshop in the Campus. Mr. Prashanth Kumar, Senior Application Engineer of the company gave a brief overview on the scope of PCB Design, companies working on it and awareness on getting electronics core jobs. Certificates were distributed to the participants on the final day of the workshop. FTD Automation Pvt. Ltd. provides superior Sales & Support in Electronic Design Automation and Printed Circuit Board industry, serving Hardware and Software markets. The company is the authorized channel partner for - Cadence OrCAD Solutions, Industry-proven PCB design suites which provide a feature-rich, fully scalable solution that can be expanded and upgraded as PCB challenges and the level of design sophistication continues to grow. TEQIP 1.3 sponsored three day workshop on “Aspects of LTE 4G” as a part of IETE-PAC activity was organized by the Department of Electronics and Communication Engineering in association with VTU, Belgavi at Sahyadri College of Engineering & Management (SCEM), Mangalurufrom 22nd to 24th March, 2019. The workshop aimed to give insight to the faculty members of VTU about the progress of Long Term Evolution (LTE) with specific reference to 4G. The workshop was inaugurated by Dr. M.H Kori, Former Technical Director, Alcatel Lucent Technologies. During the inaugural speech he emphasized on learning new technologies and tools for faculties and students. Dr. R SrinivasaRaoKunte, Principal, SCEM highlighted the importance of the workshop and advisedthe participants to get involved in the deliberations during the three days. Dr. AshwathRao, HOD Dept. of ECE briefed the program schedule in reference to the three day workshop. On the first day of the workshop Dr. M. H Kori gave an overview of Wireless communications in general and Mobile Communications with emphasis on 4G LTE. Dr. K Rajesh Shetty, Professor, Department of ECE, NMAM, Nitte, delivered topic on Fading Multipath Channels and Diversity Techniques. 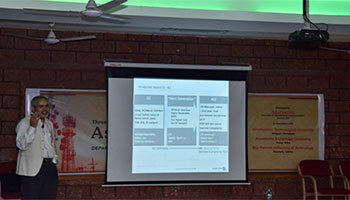 The second day was followed by Mr. Abhijith B G, Technical lead, Saankhya labs Bangalore. 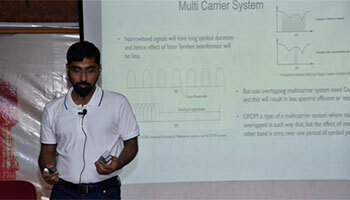 He presented the topic on Multicarrier Modulation, OFDMA, SC-FDMA, overview and channel Structure of LTE. For participants Demo on LTE was organized by Research Design Lab (RDL) Technologies which is an in-house industry located at SCEM. 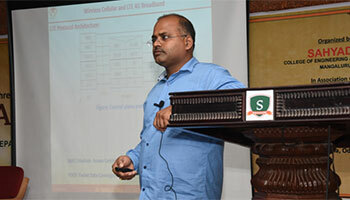 On day three Dr. SondurLakshmipathi, Founder Director, MYMO Wireless Technology Private Limited, facilitated an overview on Uplink Channel Transport Processing and Physical layer procedures. Post lunch session was taken over by Dr. RavillaDilli, Professor, Dept. ECE, Manipal Institute of Technology, Manipal, on Radio Resource Management and Mobility Management. The three-Day workshop concluded with a valedictory which was presided by Dr. SondurLakshmipathi. He motivated and inspired the fellow participants to emerge as good resource person and to build vibrant Eco-system for the nation which in turn shall produce indigenous products in the fields related to communication. Dr. RavilaDilli congratulated and distributed the certificates to the participant. Professor S SBalakrishna, Vice Principal, SCEM, during his presidential remarks congratulated all the participants and Department of Electronica and Communication for conducting the workshop successfully.DrAshwathRaoexpressed gratitudetowards all the resource persons and participants for their support and cooperation and also acknowledged all teaching and non-teaching faculty of Sahyadri for the necessary arrangements which resulted in smooth conduction of the workshop. The Department of Electronics and Communication Engineering organized one day “Workshop onVirtual Labs”, in joint collaboration with Institution of Electronics and Telecommunication Engineers Students Forum (ISF). Virtual Labs is an initiative of Ministry of Human Resource Development under the National Mission on Education through ICT. A team of ten members from NITK facilitated the sessions. Virtual Labs provide remote-access to Labs in various disciplines of Science and Engineering. These have collaboration with 12 institutions all over India which includes IIT’s, NIT’s & IIIT’s. The broad areas of Virtual Labs are Electronics & Communications, Computer Science & Engineering, Electrical Engineering, Mechanical Engineering, Civil Engineering and so on. 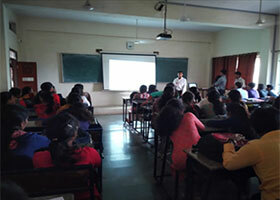 The sessions at Sahyadri were conducted for the second & third year students of Electronics & Communication Engineering. Students will get a feel of the real lab, as all lab equipment, components and lab behavior would be mimicked in the system. Extensive 2D animations are used to provide real like look and feel to the students. The instruments and components are modeled accurately to provide real like response. Interactive animations are also provided at a lot of places to enable student learning. The Department of Electronics and Communication Engineering organized IoT& Embedded System Exhibition in joint collaboration with Institution of Electronics and Telecommunication Engineers Students Forum (ISF), Ministry of Human Resource Development (MHRD) and RDL Technologies as a part of Industry & Academic Interaction. he final year students demonstrated the IOT and Embedded Systems products at the exhibition. The second and third year students utilized their time in knowing the technical details and understanding the various applications of IOT and Embedded Systems in real life. The exhibition was arranged under three segments such as Industrial Sensors, Development & Prototyping and Products. The valedictory function was graced with a presidential address by Principal, Dr. R SrinivasaRaoKunte, Mr. RaghavendraShetty, CEO, RDL Technologies Pvt. Ltd. and Dr. AshwathRao, HOD, Dept. of ECE expressed the significance of the occasion and urged the students to fully utilize this promising opportunity. 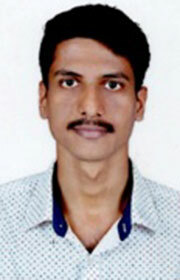 Mr. Praveen Konda, Assistant Professor, Dept. of ECE expressed his pride in organizing the event and also commented at the active participation of the students and the involvement of industry personnel. The attendees were called upon to give a feedback about the event. A few students and Industry personnel expressed a positive opinion in the role of the college in cementing the connections between experienced industries and budding engineers and also tenacity of RDL in bringing cutting edge technologies and reliability. The Department of Electronics and Communication Engineering celebrated IETE student's day on Friday, 1st of February. 1st of February is observed every year as IETE students day as per IETE guidelines and hence it was celebrated with zeal and zest at Sahyadri . The Institution of Electronics and Telecommunication Engineers (IETE) is India's leading professional society devoted to the advancement of science in Electronics and Communication, Information Technology, Computer Science and other disciplines. The IETE Student's forum and PAC was established in Sahyadri under the guidance of Dr. SrinivasaRaoKunte, Principal on 10th November 2018. Technical Presentation by Challengers Team. The day's formal function was graced by Prof. S.S Balakrishna, Vice Principal, Mr. RaghavendraShetty, CEO, RDL technologies, Dr. AshwathRao, HOD, Dept. of ECE and Mrs. Megha N, ISF coordinator. The Presidential address was delivered by the Vice Principal who was delighted to see the ISF, Sahyadri wing flourish and grow. He also encouraged the students to take an active part in all the events held at the college. The guest of honor Mr. RaghavendraSheety spoke vividly about connecting Industries to the students. Dr. AshwathRoa, HOD, Dept. of ECE shared his wisdom and spoke about the impact of disruptive, groundbreaking innovations and technologies. All the students from Department of ECE participated in the various event with much enthusiasm. The department of Electronics & Communication Engineering of Sahyadri college of Engineering and Management took up the initiative to organize the innovative idea presentation event with a view to promote new ideas in the existing technology and its application in a smart built environment. The two days project idea presentation “INNOVIDEA” was held in association with IETE Student’s forum (ISF) and Professional Activities Center (PAC) for the interested students of Electronics and Communication Engineering on 29th and 30th November, 2018. The program started with inaugural ceremony chaired by chief guest for the event Dr. R SrinivasaRaoKunte, Principal, Sahyadri college of Engineering and Management along with Dr. AshwathRao, HOD , Department of Electronics and Communication Engineering and Mr. Sharathchandra N R , Project Coordinator. 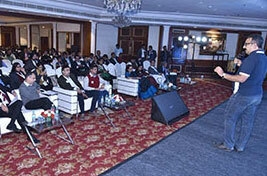 The presentations were conducted in two venues which were started at 9:30 AM. The two teams of evaluators comprised of experts from all the streams related to electronics and communication such as signal processing, VLSI, Communication and Embedded System. They were given instructions on how to evaluate the presentation. 30 minute was allotted to each team for presentation of their ideas (25 minute for presentation and 5 minute for question and answers). Total of 31 ideas from various disciplines under Electronics and Communication Engineering were presented by the participants. 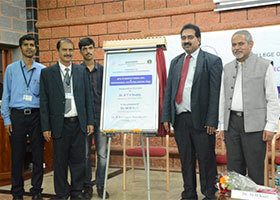 Institute of Electronics and Telecommunication Engineers Student’s Forum (ISF) and Professional Activities Centre (PAC) was inaugurated by Dr. K T V Reddy, IETE President New Delhi in the presence of Dr. M H Kori, IETE Distinguished Fellow and Former Technical Director Alcatel Lucent Technologies and Dr. R SrinivasaRaoKunte, Principal at Sahyadri. IETE is India's leading recognized professional society devoted to the advancement of Science and Technology of Electronics, Telecommunication & IT with motive of reach to un-reach. The IETE is the National Apex Professional body of Electronics and Telecommunication, Computer Science and IT Professionals. Government of India has recognised IETE as a Scientific and Industrial Research Organization (SIRO) and also notified as an educational Institution of national eminence. The objectives of IETEfocus on advancing electro-technology. The IETE conducts and sponsors technical meetings, conferences, symposia, and exhibitions all over India, publishes technical journals and provides continuing education as well as career advancement opportunities to its members. Faculty of Department of Electronics and Communication have enrolled themselves as corporate members of IETE and around 123 students have enrolled as student members. Dr. AshwathRao, Head of Department of Electronics and Communication Engineering welcomed the gathering and briefed about the IETE benefits the staff, students and the institute could avail. He also deliberated about the IETE financial assistance to organize various technical events like seminars, symposiums, expert guest lectures which in turn helps the faculty and students to get exposed to advanced technology. The inauguration was very special as the Chief Guest unveiled the curtains by pressing the remote which activated the dc motor drive and the other switch activated the servo motor and microcontroller for the flower petals stored to fall down. This was designed by one of the students Mr. Shamanth Gowda. During inaugural, Dr. K T V Reddy gave heads up about the various schemes for students and staff and also mentioned that one can get Master’s Degree from IETE even while working. The Guest of Honour - Dr M. H Kori briefed the audience about how IETE facilitates in arranging invited talks by experts working in various domains for the benefit of the students and faculty. He also emphasized on the ways in which IETE forum can help students and faculty of other branches if interested in learning and getting a degree in Electronics and Computer Science. Dr. R SrinivasaRaoKunte, in his Presidential Remarks, shared the experience of his IETE journey at his previous institute and how we can take it forward at Sahyadri to make it one of the best South Zone centres by engaging in regular activities of IETE. A technical talk on “WIRELESS AN EXPRESSION OF FREEDOM” by Dr.M H Kori, IETE Distinguished Fellow, Former Technical Director, Alcatel Lucent Technologies was held on 10/11/2018 between 2.00pm to 3.45pm for the faculty members and students of Electronics and Communication Engineering. He gave an insight on the evolution of wireless communication , cellular communication & its revolution and also elaborated various topics like cell splitting, sectoring and importance of frequency reuse. He also said about bits accommodation in bandwidth, FDMA, TDMA, CDMA and LTE network.He concluded his talk by briefing about current technologies like 3G, 4G, 4.5G and future 5G technology and the opportunity in the field of research. Department has received one Research Grants of 30 lakhs from Vision Group Science & Technology (VGST) under CISEE category and another Research Grant from VGST under SMYSR category worth 04 lakhs during the year 2014-15. The Principal Investigator of CISEE project is Mr. Ashwath Rao and Principal Investigator for SMYSR project is Mr. Steven Lawrence Fernandes. Mr. Thilak P and Mr. Vardhan M of 8th semester Electronics and Communication Engineering cleared GATE 2016 with All India Ranking, 363 and 10167 respectively. The number of candidates appeared for Electronics and Communication Engineering paper are 152318. Mr. Steven Lawrence Fernandes, Assistant Professor, Dept. 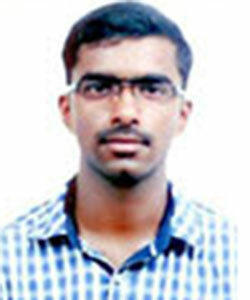 of ECE has received a research grant of Rs 80,000/- from The Institution of Engineers (India) for his research work. 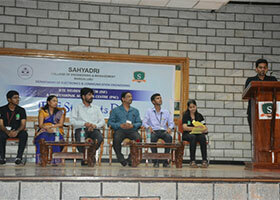 Various industry interactions and scientists from various reputed R&D institutes have addressed our students. 8th semester ECE students of 2016 won fourth place in Oral Presentation in Micro Class Category at the SAE Aero Design (East) competition, Fort Worth, Texas, USA. 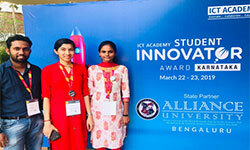 They stood at first position in the Oral Presentation round among the Indian teams at the competition. AEnCES (Association of Electronics & Communication Engineering Students) the student association for the academic year 2015-16 was inaugurated on 26th September 2015 by the Chief Guest Dr. U C Niranjan, Adjunt Professor, MIT, Director - Research and Training, MDN Labs. Dr Jose Alex Mathew invited as Resource Person as well as Session Chairman of National conference on signal and Image Processing-2015 (NCSIP-2015) organized by Vivekananda College of Engineering and Technology, Puttur, 01-02 May 2015. 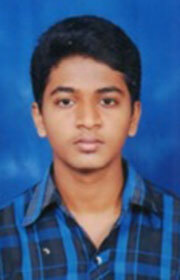 M.Tech students have undergone internship at M/s Smart link Systems Pvt. Ltd, Goa. The Google Student Community under the leadership of Google student ambassador Karthik Ramakrishnan, Semester V, Mechanical Engineering and the guidance of Ms. Saranyaraj D, Assistant Professor, Department of Electronics and Communications & Google Champion has organized a two day workshop ‘The Geek Streak’ in the Campus. The Geek Streak’ is an Android – Cloud, integrated workshop. It was inaugurated by Dr. M.N Birje, HoD of Department of MCA, VTU Belgum, Mr. Praveen Hanchinal, CEO INSPIRE- groups and Mr. Amit Tank, faculty member at SRM Institute, Bangalore. 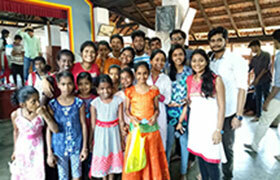 The two day workshop enabled the students to apply the acquired knowledge to solve the problem statements obtained from local NGOs, and Muncipal Bodies in Mangalore. It was followed by the presentation of the created applications before a jury consisting of these NGO Members and Employees of City Corporation. The venue was decorated with creative depictions of Android Robot and Google colors and was appreciated by everyone. The training programme on “Optical Fibre Communication Systems” was inaugurated by the Chief Guest, Mr. Balasubramaniam Iyer, Vice President, Reliance JIO Infocomm Ltd. The principals and placement officers of various colleges and the selected trainees attended the inaugural function. The training programme is a part of “Mission VTU-Empower 10000” scheme launched by VTU, Belgaum, to train the students and get them placed in industries. The chief guest in his inaugural address lauded the programme and extended his full support in the placement process. Dr. U. M. Bhushi, Principal, Sahyadri College of Engineering & Management, Mr. Geo D’Silva, Special Officer (P&T), VTU-Belgaum, and Prof. Abdul Kareem, Coordinator graced the occasion. With the cases of crimes against women on the rise, self-defense for women has become a necessity more than ever. 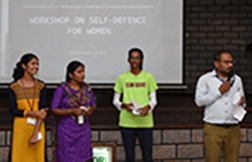 With a view to help a woman to be better prepared to protect herself, a ‘Workshop on Self-defense for Women' was conducted. 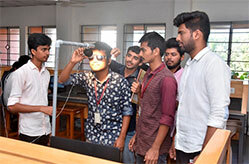 The initiative was taken by the Department of Electronics and Communication Engineering and AEnCESStudents Association. And what better occasion than the International Women's Day itself!! 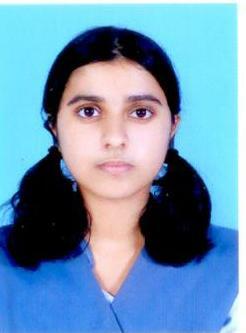 Ms. SameekshaShetty, student of ECE second year was the resource person of the day. Students from ECE Department Ms. SushmaShettywho represented VTU National Cross Country twice and Ms. Ankitha NSS Best Volunteer Award were introduced and appreciated during the occasion. They were also asked to address the gathering. The HoD – Department of ECE addressed the women faculties. The session began with a couple of warm up exercises. Ms.Sameeksha then introduced the techniques for self-defense. The students paired with each other and practiced the same with great enthusiasm. The techniques included few punching movements etc. Prof. Kiran Kumar V G, Department of Electronics and Communication Engineering presented a paper titled “Implementation and Analysis of Analysis of Cryptographic Ciphers in FPGA” in the International Conference on Emerging Technologies in Data Mining and Information Security- IEMIS 2018 at UEM, Kolkata. The conference was organized by School of Information Technology, Institute of Engineering & Management Group, India and sponsored by Springer NSERB, DST and IEEE Kolkata Section. 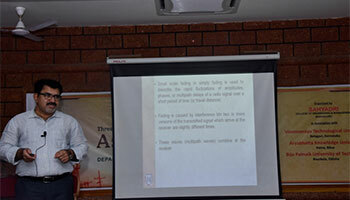 In his inaugural address the Dean gave insight on soft skill sand stressed on its importance in today’s student fraternity. Improving any sort of skills in their specific domain makes them good engineers he said and quoted a few examples to support his claim. Designated faculty from the department have briefed about the respective topics which they are going to deliver during the course of this five-day workshop. The Day Five started with finding phase shift from obtained phase margin of the RC frequency compensated operational amplifier designed previous day. New concepts like fingers and multiplier which are the attributes of a transistor in GPDK 180nm was discussed and demonstrated. The new technique of obtaining layout called as common centroid layout technique was demonstrated where an optimized way of designing layout of the schematic was shown using the module generator. This technique is used to overcome process variation which occurs due to factors like doping. This technique is mainly used in the analog physical design industry. The afternoon session was conducted on AMS which stands for analog mixed signals. Here a NAND circuit was done where inverter was implemented in analog and AND gate in digital, Verilog code. Finally, the importance of this method was discussed. The Five-Day short-term course on Analog IC Design came to an end with the valedictory ceremony. Resource persons - Mr. Sumith and Mr. Naveen from Entuple shared their views and motivated the students to take up the vast field of electronics specifically analog physical design. Dr. Ashwath Rao, HOD of Dept. of Electronics and Communication Engineering addressed the gathering and shared his views on short-term course conducted and asked students to make use of it and practice which can help the students to make a start in VLSI analog physical design as their career. Prof. Praveen Kumar Konda, Dept. 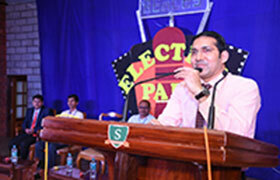 of Electronics & Communication Engineering gave a report on the Five day event. Dr. Umesh M Bhushi, Principal motivated the students to make use of various opportunities given. He encouraged students to develop technical skills. Certificates were also distributed to participants. During the Day One of the Analog IC Design – Short Term Course organized by the Dept. of Electronics & Communication Engineering, the resource persons - Mr. Sumit Patil, Senior Application Engineer and Mr. Navinsankar J, Field Application Engineer from Entuple Technologies Pvt. 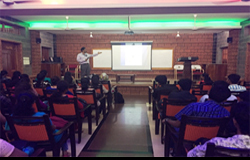 Ltd, Bengaluru introduced the students to various technologies of VLSI design like 180nm, 90nm, 45nm etc and a brief discussion was held. The procedure involved in obtaining the GPDK file for a particular design was demonstrated. They also explained the various cadence tools like Spectre, Assura & Virtuoso. Students were able to synthesize basic amplifier circuit topologies based on the specifications that were provided to them. During the Day Two, the resource person gave a detailed description on the important parameters that were to be considered during the designing of power amplifiers and other analog circuits. Students had to solve a problem wherein they had to design an amplifier based on the specifications that were given by the resource person. The analysis was done in three steps. The first step involved parametric analysis of a NMOS, the second involved parametric analysis of a NMOS and a load resistor and the third involved the parametric analysis of a PMOS. Later, the layout constraints and physical verifications for the design of the amplifier were carried out till GDSII. Five-Day short term course on analog IC design organized by the Department of Electronics and Communication Engineering was inaugurated by Principal, Dr. Umesh M Bhushi. He addressed the students and participants about the importance of short term industry oriented courses and how students can get benefit from these initiatives provided by the department. Dean Academics Dr. J V Gorabal also graced the occasion. Dr. Ashwath Rao, HOD, Dept. of Electronics and Communication Engineering gave an overview of the course and emphasized the importance of the course and job opportunities in the field of analog IC design. 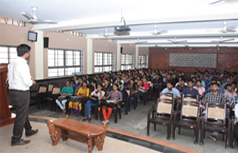 Resource persons Mr. Navin Sankar, Field Application Engineer - Entuple Technologies, Bengaluru and Mr. Sumit Patil Application Engineer - Entuple Technologies, Pune addressed the participants and students. He advised them to use this opportunity provided by the institution. Dr. Steven L Fernandes, Assistant Professor, Department of Electronics and Communication Engineering is selected as Postdoctoral Researcher for National Institutes of Health (NIH) project. He would be working in the area of Medical Image Processing for a period of 1 year at the University of Alabama Birmingham, USA. ‘The Geek Streak’ is an Android – Cloud, integrated workshop. It was inaugurated by Dr. M.N Birje, HoD of Department of MCA, VTU Belgum, Mr. Praveen Hanchinal, CEO INSPIRE- groups and Mr. Amit Tank, faculty member at SRM Institute, Bangalore. 4 26-09-2014 Dr. Jose Alex Mathew HoD, Department of Electronics and Communication Engineering, PA College of Engineering, Mlore AEnCES, Student Association Inaugurated and guest lecture on "Digital Image Processingin Medical Field"
6 21-07-2014 Mr. Balasubramaniam Iyer, Vice President, Reliance JIO Infocomm Ltd. Training Programme on Optical Fibre Communication Sys. Best Project Awards -Final Year B.E. Title:VLSI Implementation of High speed digital signal processor “VMPV_008K using vedic mathematics and proposal of interfacing software are using. Consolation Prize: Shalmali J shetty, Rea Eunice VarshaMuthappa V, ZuhairaMarzuqa Bashir. Best Project Awards - III Year B.E. Best Project Awards – II Year B.E. The SPSS project and the research paper were guided by Mr. Steven Lawrence Fernandes, Assistant Professor, Department of Electronics & Communication Engineering. SPSS (Student Project Support Scheme) project work is published as a Research paper titled "A review on various state of art technique to recognize occluded face images" in the IEEE Xplore Digital Library. The Research paper is authored by Ms. Sheethal K. Rao and co-authored by Ms. Patel Haniben, Ms. Prajna, Mr. Pratheek, Mr. Rakshan V. Devadiga, Ms. Shivani Kottary, Ms. Surakshitha, and Mr. Thilak P., Semester VI, Department of Electronics and Communication Engineering. http://ieeexplore.ieee.org/xpl/articleDetails.jsp?arnumber=7124977. A technical paper entitled "A VLSI Design for Image Scaling Processor Technique Using High Boost Filter" by Mr. Rudresh Kumar C. S., Semester IV M.Tech. (VLSI) and Mr. Savidhan Shetty C. S., Assistant Professor, Department of Electronics & Communication Engineering, has been published in the International Journal of Research in Information Technology (IJRIT), Volume 3,Issue 5, May 2015. Tech Vision 2015, a two-day intra-collegiate project competition was held in the Campus. The main objective of this event is to inspire the young minds of the engineering students by providing them a platform to demonstrate their skills and knowledge through projects. More than 50 Lakh rupees has been spent on Student Project Support Scheme (SPSS) wherein the grants in terms of 5000, 10000, 25000 and 50000 INR are being provided to each of the qualified student projects. More than 200 projects including SPSS and Non-SPSS projects, and VTU final year projects of B.E./M.Tech/MCA students were displayed. More than 500 students participated in the event demonstrating their engineering talent. Diverse technologies were displayed such as ATVs, 3D printers, 3D aerobic planes, Sail planes, Quadracopters, Octo-copters, Multiengine test rig, wind energy pump, earthquake resistant building, low-cost water filter to name a few. Around 12 external faculty from other engineering colleges were invited as judges for this event. Click here to view the winners and their projects. 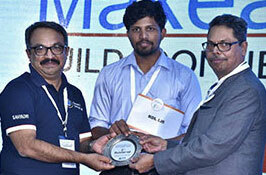 Continuing the winning spree, the students of the College have bagged the first, second and fourth place out of five prizes in the Automotive Embedded Challenge (AEC), organized as part of International Conference on Embedded System Automotive & Avionics held at IISc, Bangalore in association with National Instruments, Xilinx and LDRA. The four projects proposed by Sahyadri College of Engineering & Management students under the guidance of Prof. Abdul Kareem, Head, department of Projects and Funding were selected for the final round. 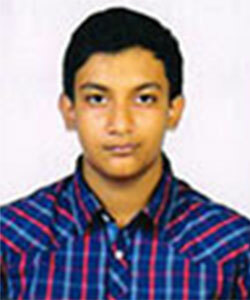 In the final round held at IISc, Bangalore, Sahyadrians bagged three prizes. The aim of the Automotive Embedded Challenge (AEC) was to identify, promote and reward outstanding engineering talents across India. The contest provided a level-playing field for every budding engineer in automotive field to display his technical brilliance. It provided a platform to engineering students to develop their presentation skills and marketing capabilities by presenting idea of their choice to a Review Panel. Through a rigorous and challenging selection process, a distinguished panel of judges comprising of academic and industry leaders selected top five from a nationwide pool of thousands. Bheemanna Khandre Institute of Technology, Bhalki,Bidar. Mangalore Institute of Technology & Management, Mijar, Mangalore. “Our Girls Power Lifting team emerged has champions and Boys Runners up and Deeksha P. of 1st sem MBA awarded as Best lifter in women’s section for the year 2018 at VTU State level Inter Collegiate Power Lifting Competition held at Sahyadri College of Engineering & Management, Mangalore from 28th & 29th September, 2018. Our 2 Girls participated in VTU Level Single zone Swimming competition held at BMSCE, Bangalore on 3rd October, 2018. Our Girls Throw ball team emerged as champions at VTU level Mangalore zone & 4th place in Inter zone Throw ball tournament held at St. Joseph Engineering College, Mangalore & NMIT, Bangalore respectively from 8th to 12th October 2018. Our Boys & Girls Wrestling team participated in VTU Level Single zone Wrestling competition held at Sapthagiri CE, Bangalore from 15th to 17th October, 2018. Sahyadri Athletic team emerged as Over all Runners Up ( with 70 points) at VTU level Inter Collegiate Athletic competition held at SJCIT, Chikballapur from 25th to 29th October, 2018. 130 colleges & 1400 Athletes participated from different colleges. Our Girls team won the overall Championship in girls section with 60 points. March Past team won the 2nd place. Our girls Relay team has created a New meet record with the timing of 53.8 sec. they have broken their own record which was created in the year 2017 with the timing of 54.04 sec. and Namrasha N. Ganiga created New Meet Record in Hammer throw by throwing 30.85 mtrs. Old record was 25.93. 1st place in 100 Mtrs. & 200 Mtrs. Our Girls Weight Lifting team emerged as champions at VTU State level Inter Collegiate Weight Lifting Competition held at GAT, Bangalore from 30th & 31st October, 2018. Sushma 8th Sem E&C Cross Country All India level Represented VTU at Inter University All India Level Athletic Competition held at Mangalore University, Karnataka She even selected to participate in All India Inter University Cross country competition held at Gulbarga University, Karnataka. Shashwath M.R. 8th Sem Civil Cross Country All India level Represented VTU at Inter University All India Level Cross Country Competition held at Gulbarga University, Karnataka. Gowri Ganesh 8th Sem Mech Volleyball South India Level Represented VTU at Inter University South India Level Volleyball & Handball tournament held at K.L.University Veddeswaram, Guntur, AP. & Anna University, Tamil Nadu respectively. Swathi 8th Sem Civil Volleyball South India Level Represented VTU at Inter University South India Level Volleyball tournament held at K.L.University Veddeswaram, Guntur, AP. Maithri. 2nd Sem MBA Swimming All India Level Represented VTU at Inter University All India Level Swimming Competition held at VTU University, Karnataka. Deeksha P 2nd Sem MBA Athletics All India Level Represented VTU at Inter University All India Level Athletic, Weight Lifting ^& Power lifting Competition held at Mangalore University,Karnataka. Acharya Nagarjuna University, Andrapradesh & Calicut University, Kerala. Respectively. Ananya Shetty 8th Sem E&C Handball South India Level Represented VTU at Inter University South India Level Handball tournament held at Anna University, Tamil Nadu. Shobith G. Rai 4th Sem MBA Power Lifting All India Level Selected to participate at VTU at Inter University All India Level Power lifting Competition held at Calicut University, Kerala. VTU Inter Collegiate Single Zone Power Lifting competition was Organized by our college on 28th & 29th September, 2018, at Sahyadri Campus. 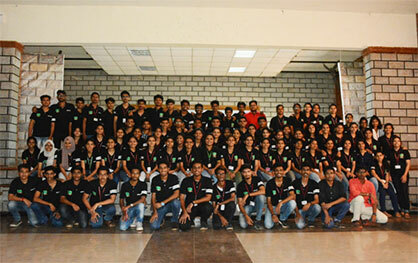 142 boys & 43 girls from different engineering colleges of Karnataka participated in the competition. There were 8 weight categories in Boys section & 7 weight categories in girls section. VTU Inter Collegiate Mangalore Zone Cricket selection trials was Organized by our college on 20th & 21st September, 2018, at Nehru Maidan, Mangalore. 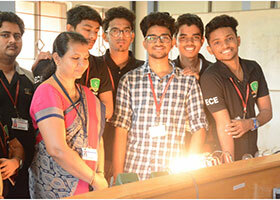 40 Boys from different engineering colleges of Mangalore zone participated in the competition. 5 Selection committee members attended the selection trials who were appointed from VTU to select the Mangalore zone cricket players. Conducted VTU Athletic coaching camp in our college campus from 19th to 23rd November, 2018. The team later participated in ALL India Inter University Athletic competition held at Alva’s Moodabidri. Abhishek U, Abhishek Dubey, K ChiragRao and FebinPhilix – Students of final year Electronics & Communication Engineering qualify for the quarter final round of IICDC 2018 with Team ID 360370 and received 200$ Texas Instrument products for further development of the project. Texas Instruments in collaboration with Department of Science and Technology (DST) announced the DST & Texas Instruments India Innovation Challenge Design Contest 2018 anchored by NSRCEL, Indian Institute of Management, Bangalore (IIMB) and supported by MyGov. This contest is open for all Indian engineering students pursuing undergraduate, postgraduate & Doctoral degrees with Indian engineering colleges. The team is all set to submit the project for Quarter Finals before the deadline of March 25th 2019. “IESA Makeathon" an India Electronics & Semiconductor Association (IESA) initiative to enable the maker community in India drive technology innovation, is the largest designing event in South Asia. A total of 20 teams were selected from 36-hour overnight design challenge that spanned across 5 cities. Mr. Nithin T from the fifth semester Electronics & Communications Engineering and Mr. Pradeep Kumar from the Dept of Electronics & Communications Engineering jointly with RDL participated at the Bengaluru selection round and won the Golden Ticket for the Finale. At the finale that was held in New Delhi, this team was judged as the 2nd Runners-up. The prize included plaque, incubation opportunities, and other benefits. 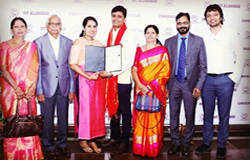 This event provided the opportunity to network with industry leaders and innovators that would enable Sahyadri to benchmark and rise to Global standards. KAYNES, Pathfront, QSoCs Technologies Pvt. Ltd.
Dr. Steven Lawrence Fernandes has Postdoctoral Research experience working in the area of Deep Learning at The University of Alabama at Birmingham, USA. His Ph.D. work Match Composite Sketch with Drone Images has received patent notification (Patent Application Number: 2983/CHE/2015). Dr. Fernandes has 05 years of industry experience working at STMicroelectronics Pvt. Ltd and Perform Group Pvt. Ltd. He has authored the book Raspberry Pi 3 Cookbook for Python Programmers – Third Edition, published by Packt, UK. His Udemy online course Image Processing Applications on Raspberry Pi – For Beginners has more than 1000 students enrolled from 70 different countries. He has received a verified certificate of achievement from Microsoft. He has jointly published research articles in Science Citation Indexed (SCI) Journals, Emerging Sources Citation Indexed (ESCI) Journals, Scopus (Elsevier) Indexed Journals. He has also contributed chapters for Springer Advances in Intelligent Systems and Computing (AISC) book series and presented articles at various IEEE, ACM, Springer and Elsevier International Conferences. "Cancer prognosis and prediction using image processing applications"
As research project, developed a unique, useful and first of its kind system ‘On-Line Character Recognition System’ for Kannada and other Indian languages to recognize the handwritten characters written on a Digitizer pad. •	The system has very good recognition rate and takes care of variations in writing like size, distortion and rotation. It earned lot of appreciation from all corners. It was news in leading national newspapers and TV channels. •	The system methodology was extended to the Recognition of other Indian languages like Telugu, Tamil and Hindi. •	Presented and gave demonstration of the research work in several international and national conferences. •	Govt.of Karnataka recognized the research work and sponsored the visit to the IEEE international conference ISPACS-2000 held at Honolulu, USA. IIIrd rank in VTU. (M.Tech: (Microelectronics and Control systems) June 2005). 1.OPTIMIZATION OF FOOD-WASTE BASED BIOGAS DIGESTOR ANDITS IMPLEMENTATION IN RURAL AREAS won BEST PROJECT OF THE YEAR AWARD 2016 in 39th series KSCST SPP from KSCST IISc BANGALORE. 2.SMART PORTABLE POWDER SPRAYER FOR AGRICULTURE PURPOSE won the 2nd prize in SRISTI 2016. 3.SMART WATER METER Project got BEST PROJECT OF THE YEAR 2014 in 37th series KSCST SPP from KSCST IISc Bangalore. 4.SMART SOIL ANALYSER Project got BEST PROJECT AWARD in SRISTI 2012 Mangalore. 5.In IET (International Engineering Telecommunication) two of my projects got 6th and 8th project awards in 2012. · Service award from Society for Design and Process Science, USA for his outstanding service contributions in the year 2017. · Patent Notification for “Match Composite Sketch with Drone Images” (2983/CHE/2015), Government of India. · Research Grant from “The Institution of Engineers” (INDIA), for Ph.D. Research. · “Young Scientist Award” by Vision Group on Science and Technology in the year 2014, Government of Karnataka and Seed Money of 04 lakhs to initiate Research. · Research Grant from “Karnataka State Council for Science and Technology” (KSCST), at Indian Institute of Science Campus, Department of Science & Technology, Government of Karnataka. · “Star Employee Award” from Perform Group Pvt. Ltd., UK for exceptional performance in Quality Assurance of Goal.com applications in 36 languages. · Rated 5/5 “Outstanding” Quality Assurance Engineer for improving quality of software. 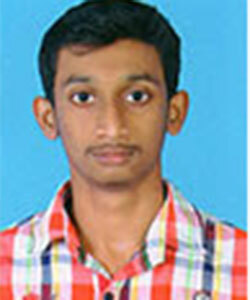 · “First Class with Distinction” (9.23 CGPA) in M.Tech, Manipal Institute of Technology, Manipal. · “10/10 GPA” for M.Tech Project carried out at STMicroelectronics Pvt. Ltd, Greater Noida. 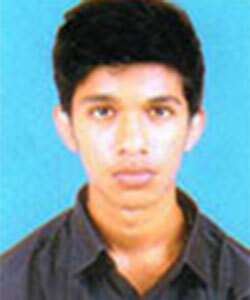 · “M.Tech Topper” Second Semester (9.40 GPA), Manipal Institute of Technology, Manipal. · “First Class with Distinction” in B.E, Visvesvaraya Technological University, Belagavi. VTU Blues, VTU athletic champion. VTU Zonal champion in throw ball. VTU runner up in Power lifting. Have won in VTU fest under Folk, Drama, Skit, Mime competitions.